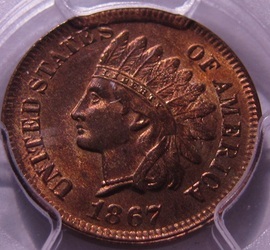 As I'd mentioned on my home page, I got my start collecting the Indian Head series as a child, and it's been my life's work to put together the finest set I can manage. 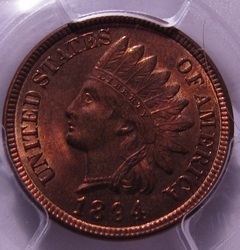 What you see below is the result of over 35 years of collecting. 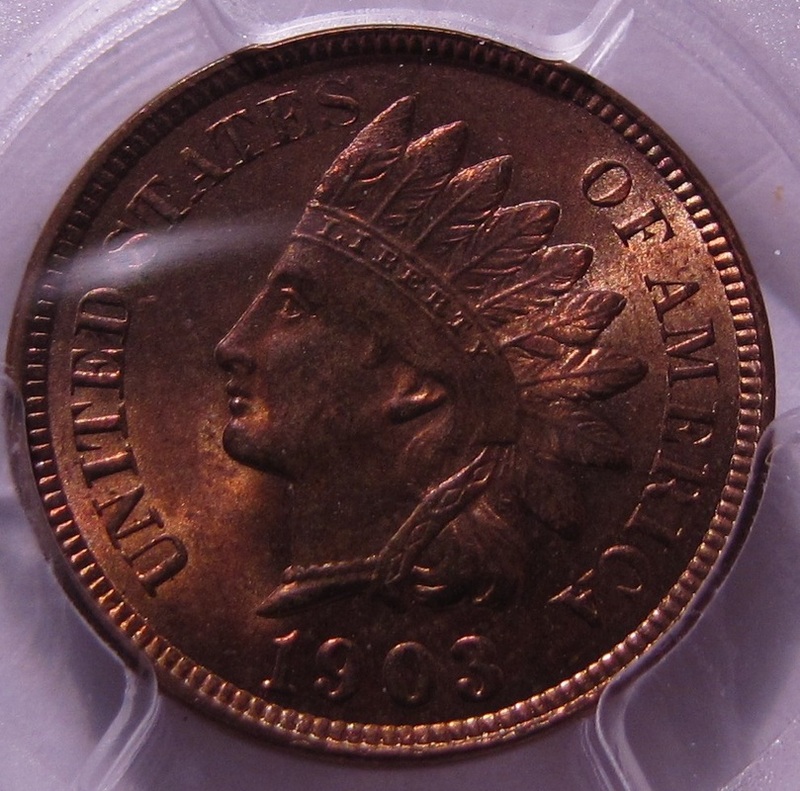 I'm still actively upgrading my set, and have just added a bunch of hard to find dates in UNCIRCULATED condition, something I never thought I could do! 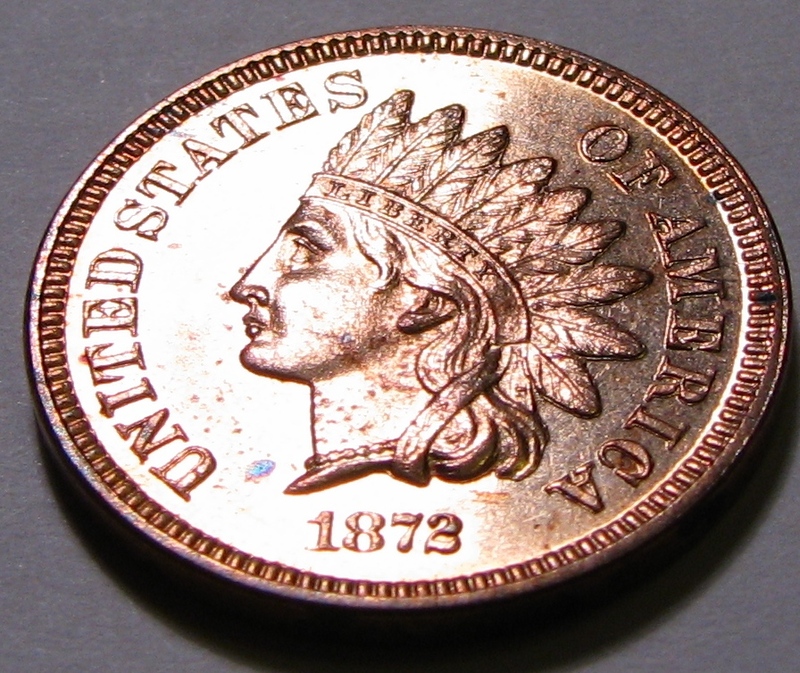 I'm so pleased to tell you that fully TWO-THIRDS of my Indian Head Cents are in UNCIRCULATED condition! 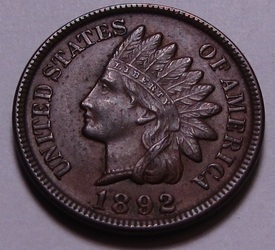 Meaning 38 of the 58 coins in my complete set (including the Flying Eagles), which is a heck of an accomplishment for me! 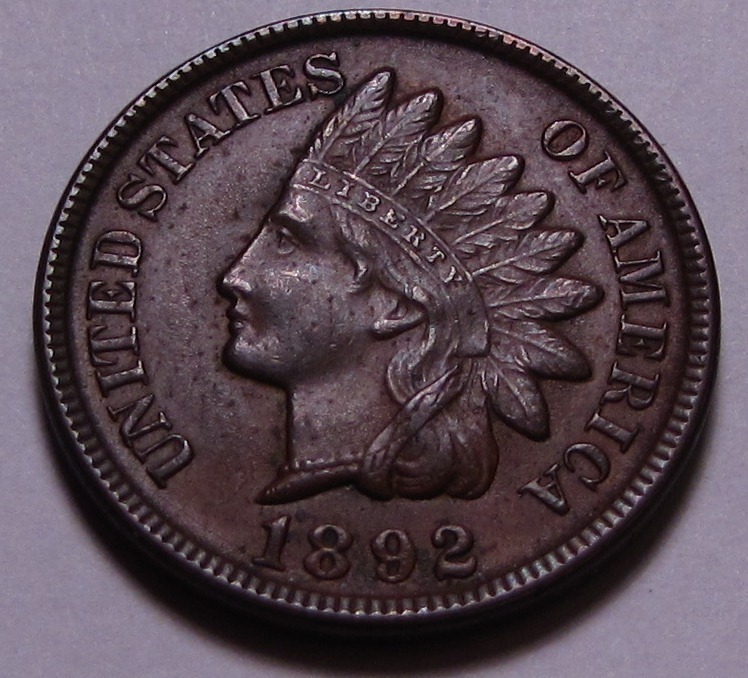 And the others are Extra Fine to About Uncirculated, except for the 1877, which is a VG-8. I even have a couple of PROOF Indians in my set! 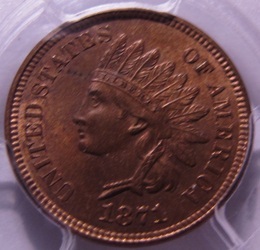 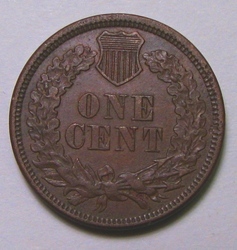 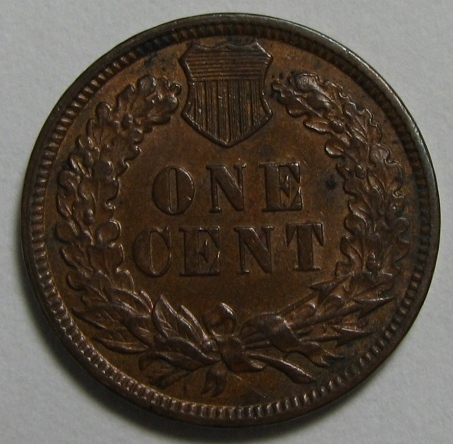 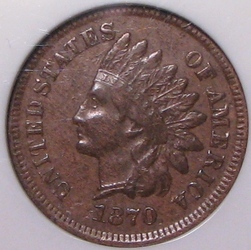 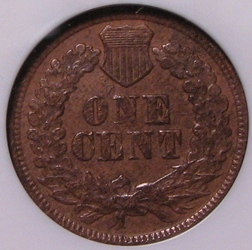 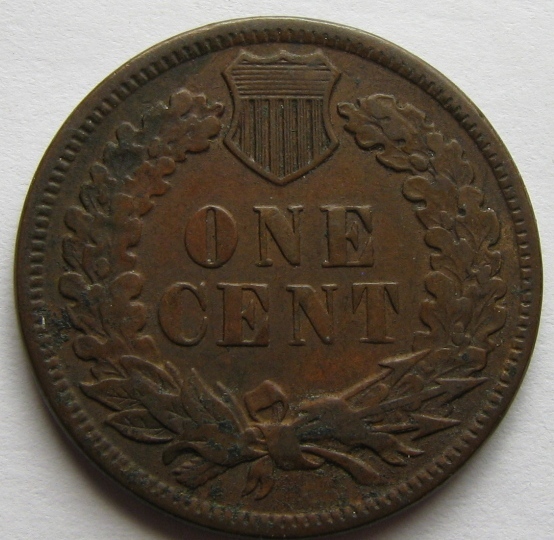 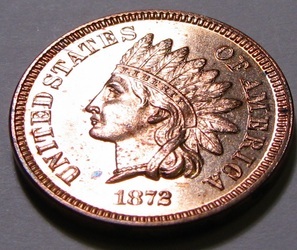 These first Indian Pennies were made of a copper-nickel alloy and were often referred to as "white" cents due to their lighter coloring; also called "nicks" due to their composition containing nickel. These first Indians were slightly thicker than later cents. 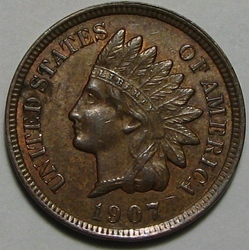 Because of the harder metal alloy used, many of these coins had strike issues, resulting in weaker designs. These Civil War era coins were struck in large numbers to meet increased demand for cents, as people began hoarding them. 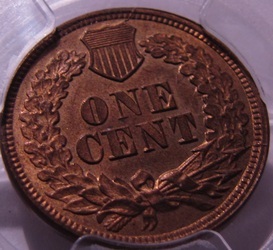 The 1859, 1863 and 1864 have all been graded by PCGS. 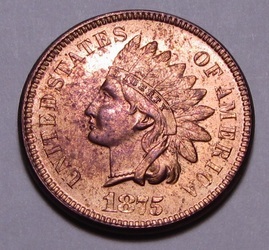 AU58, MS63 and MS64 respectively. 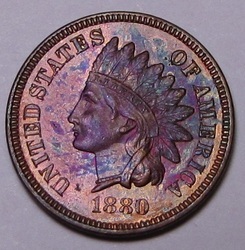 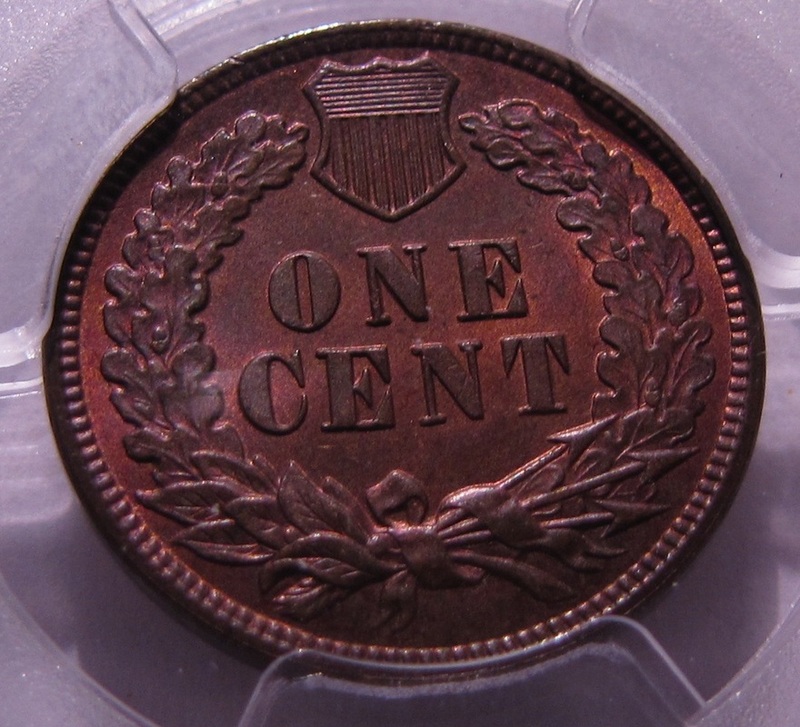 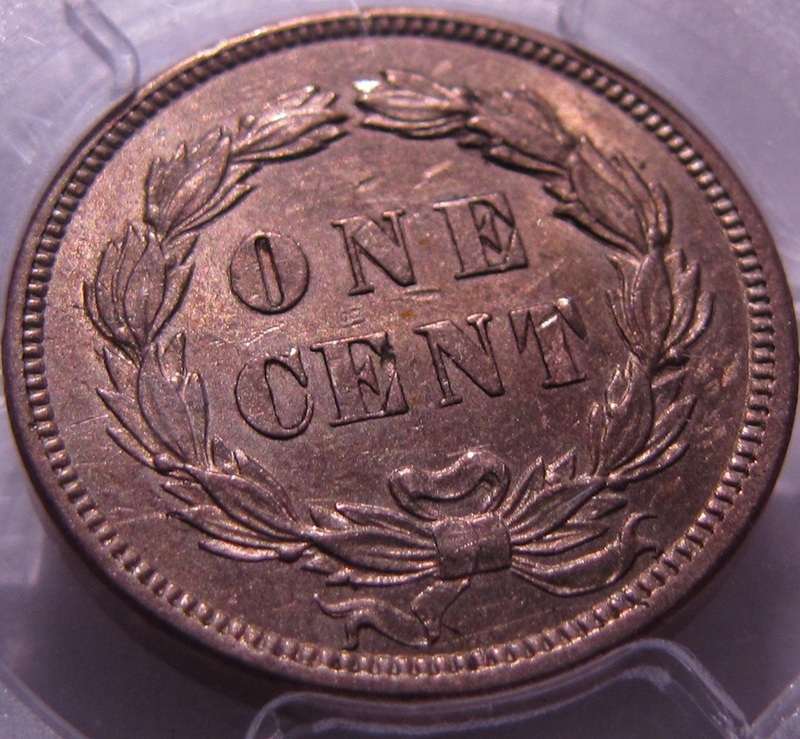 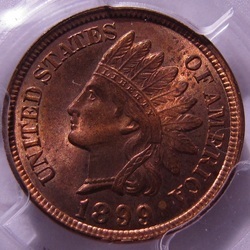 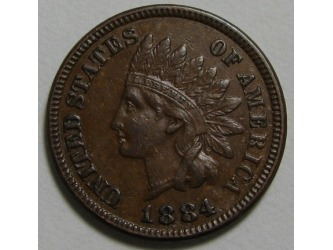 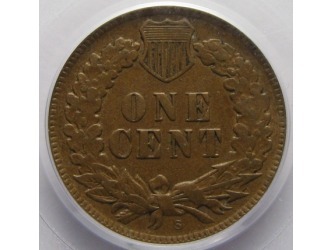 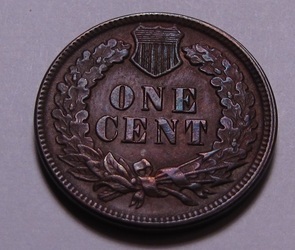 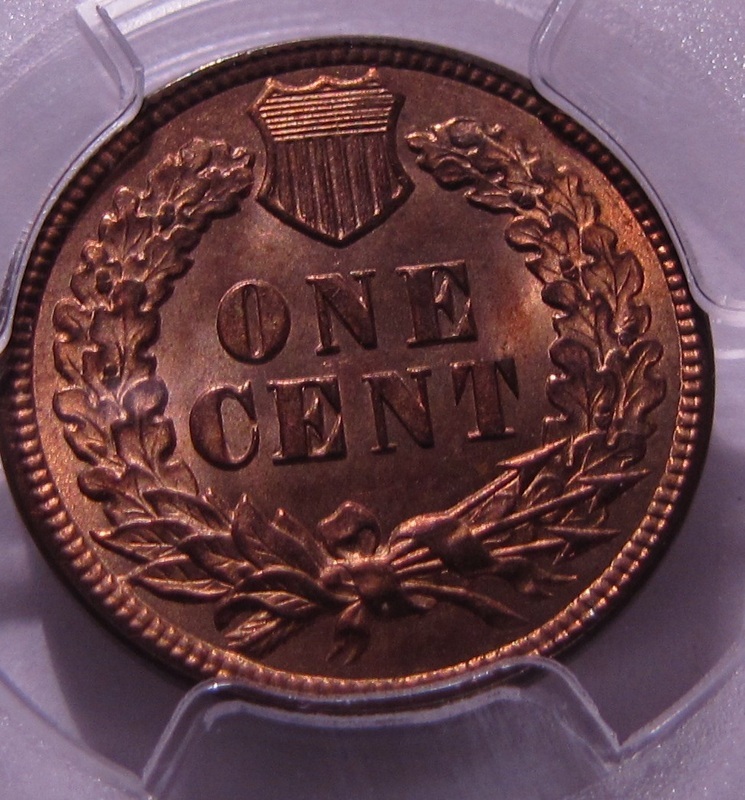 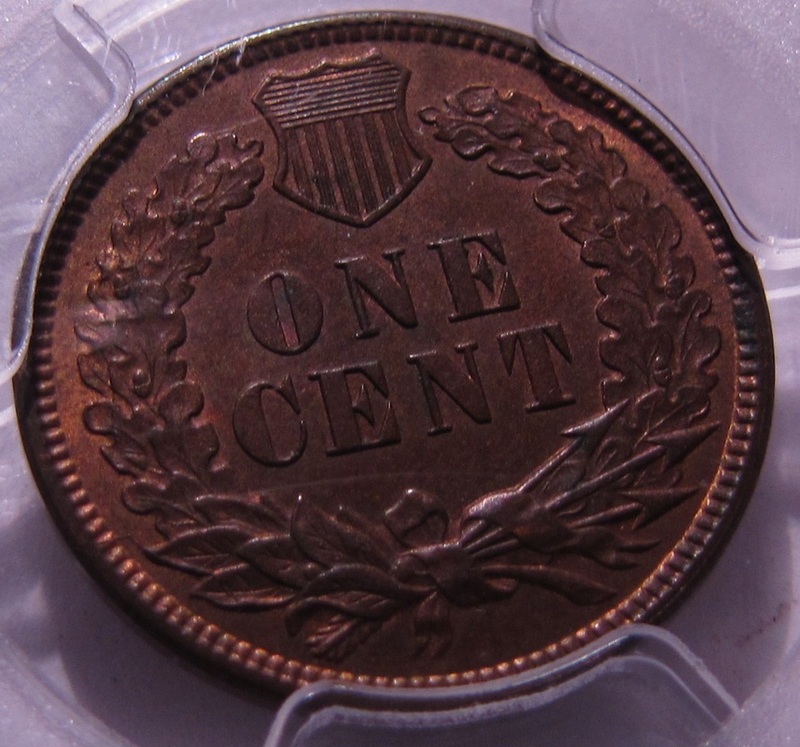 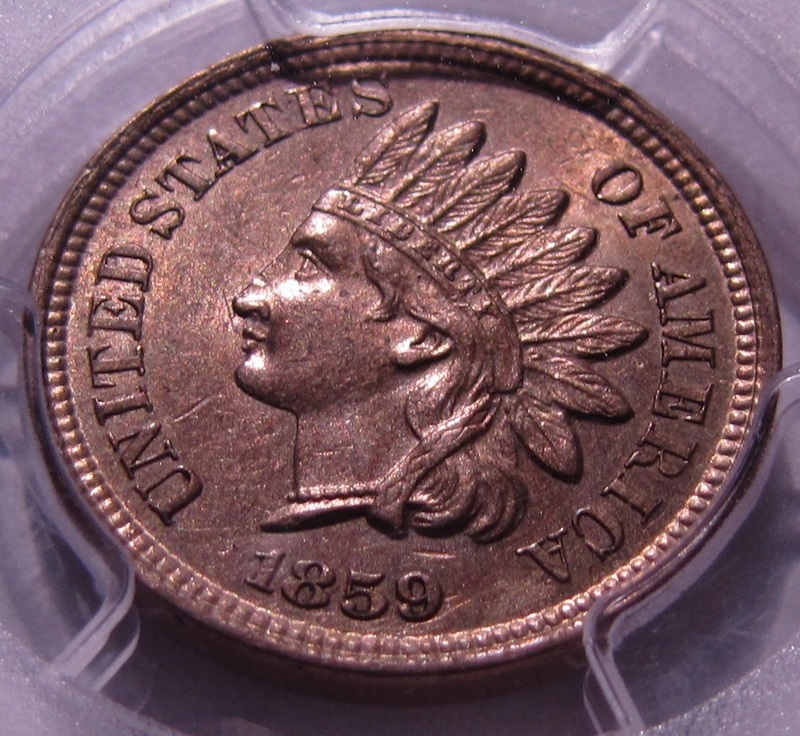 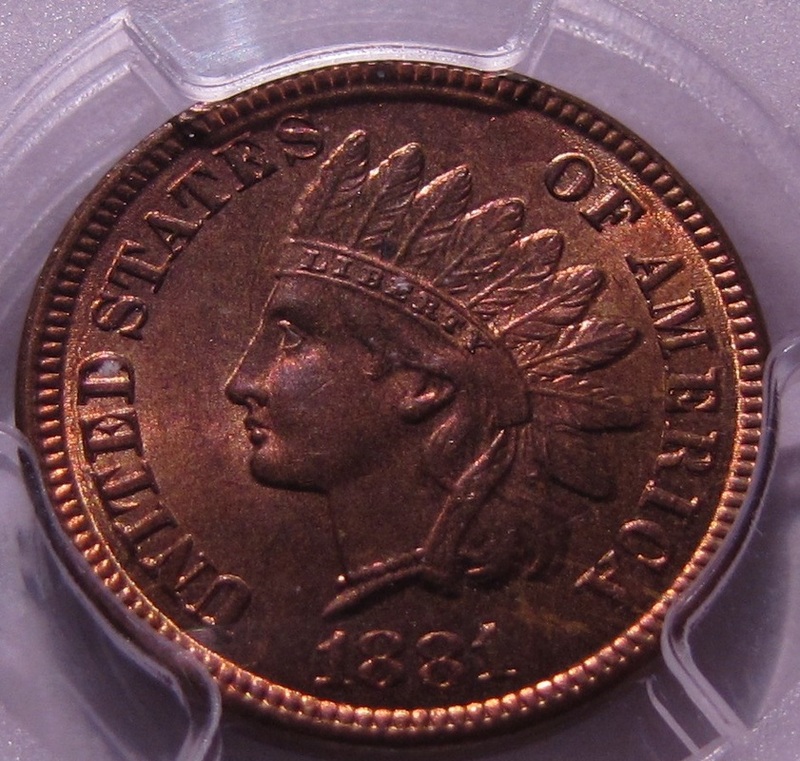 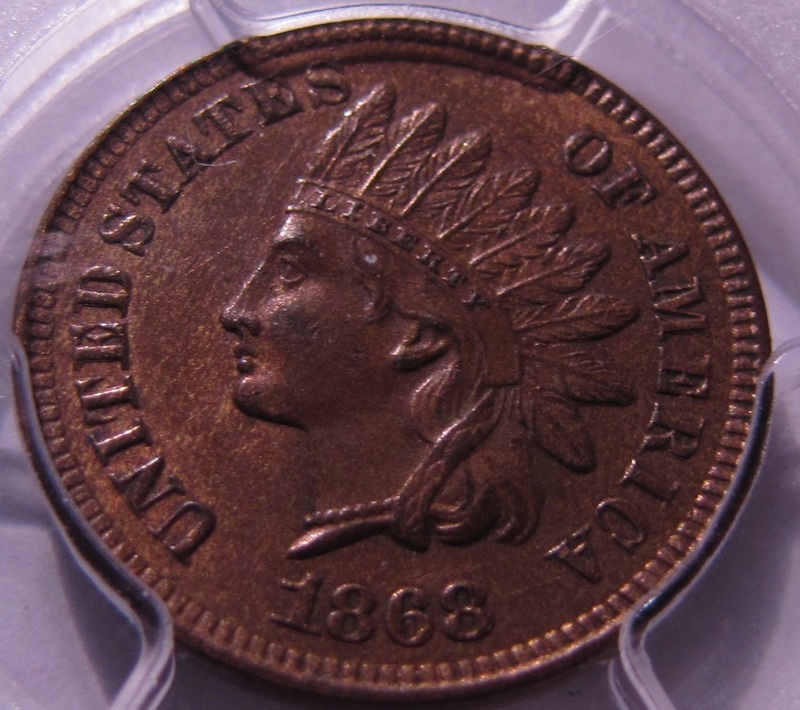 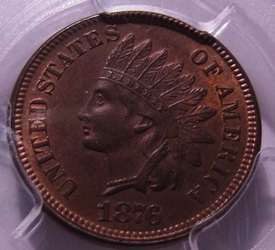 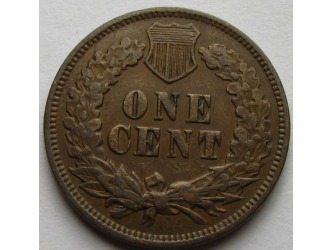 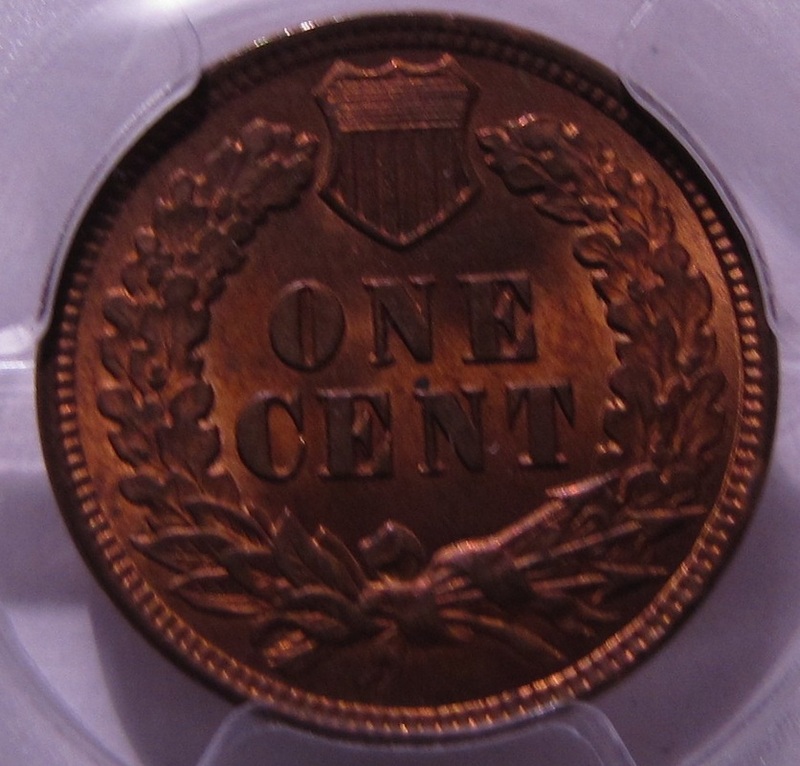 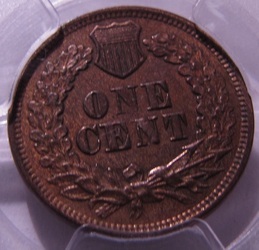 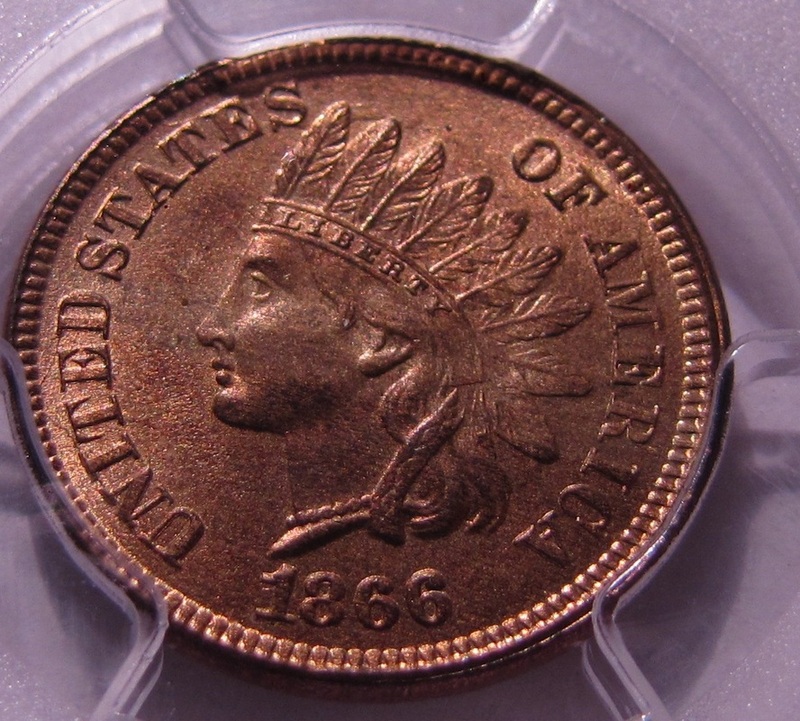 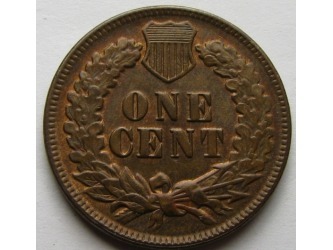 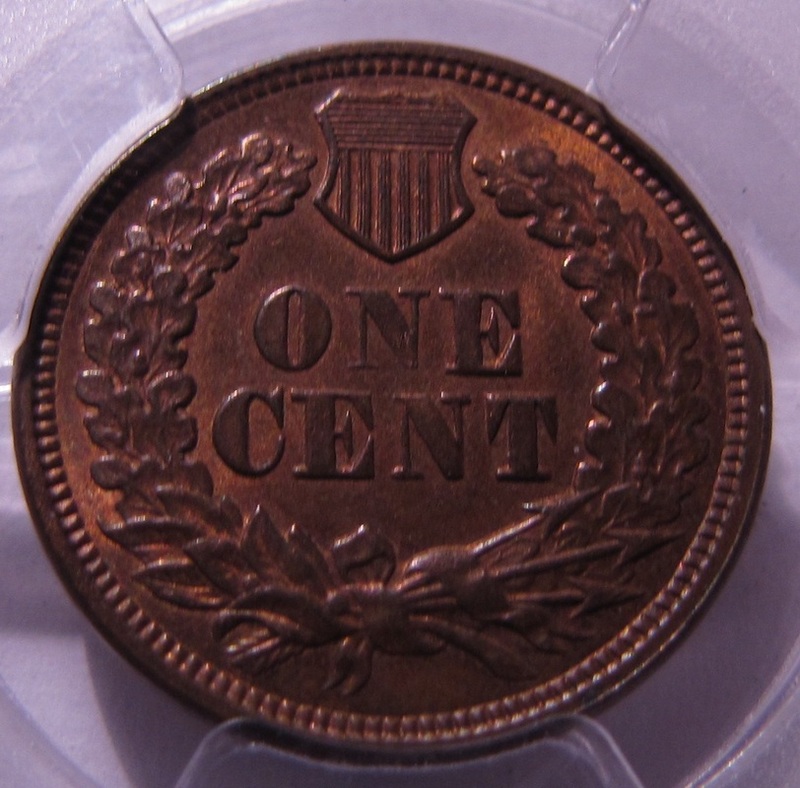 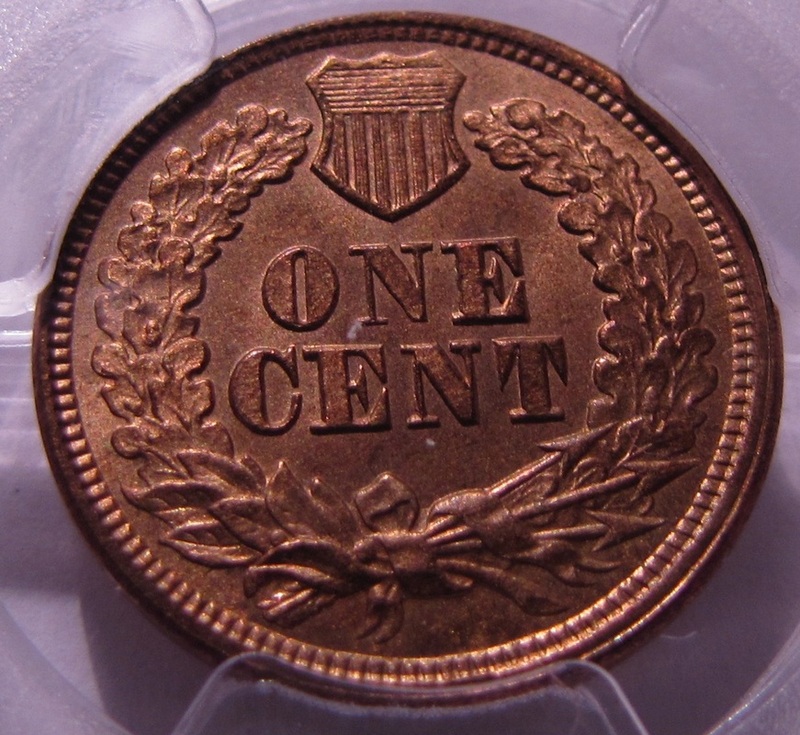 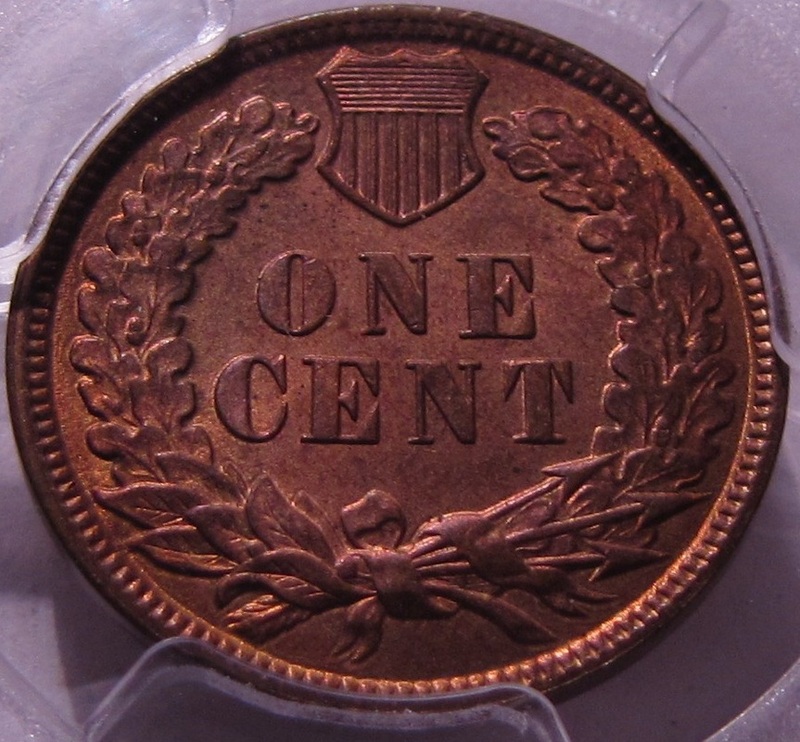 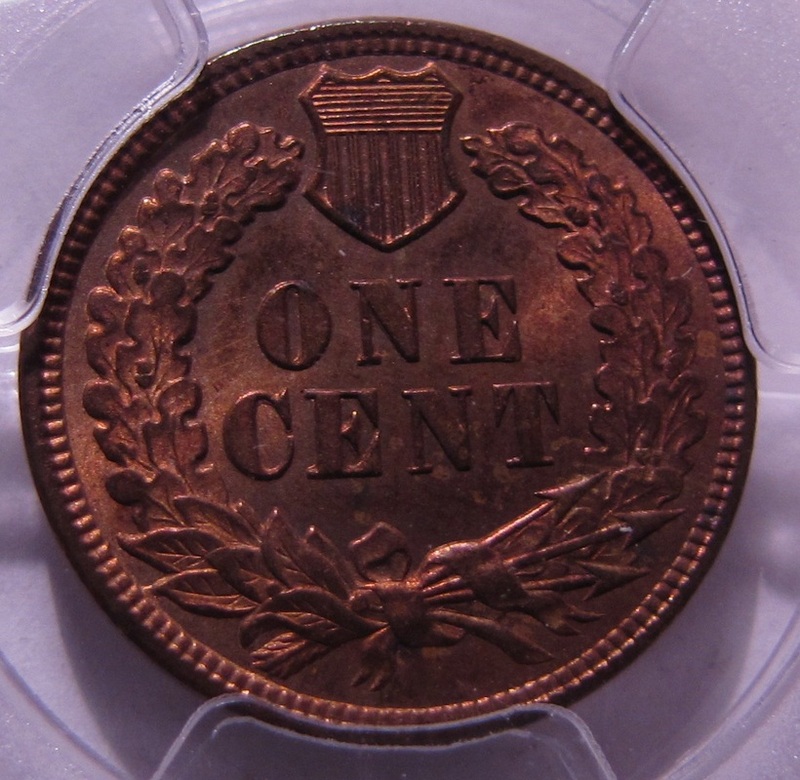 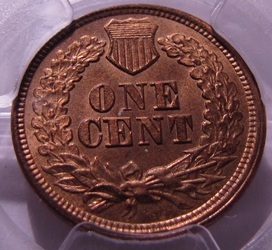 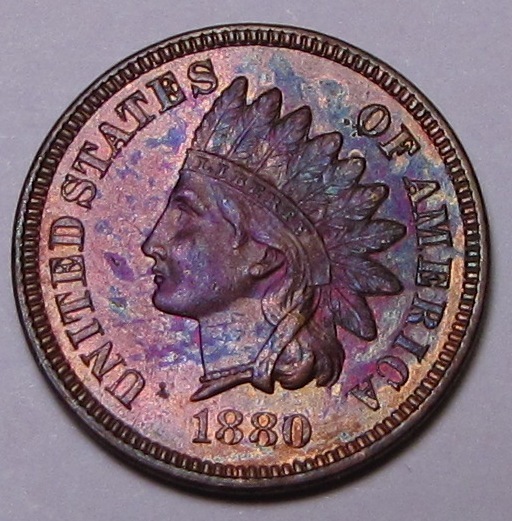 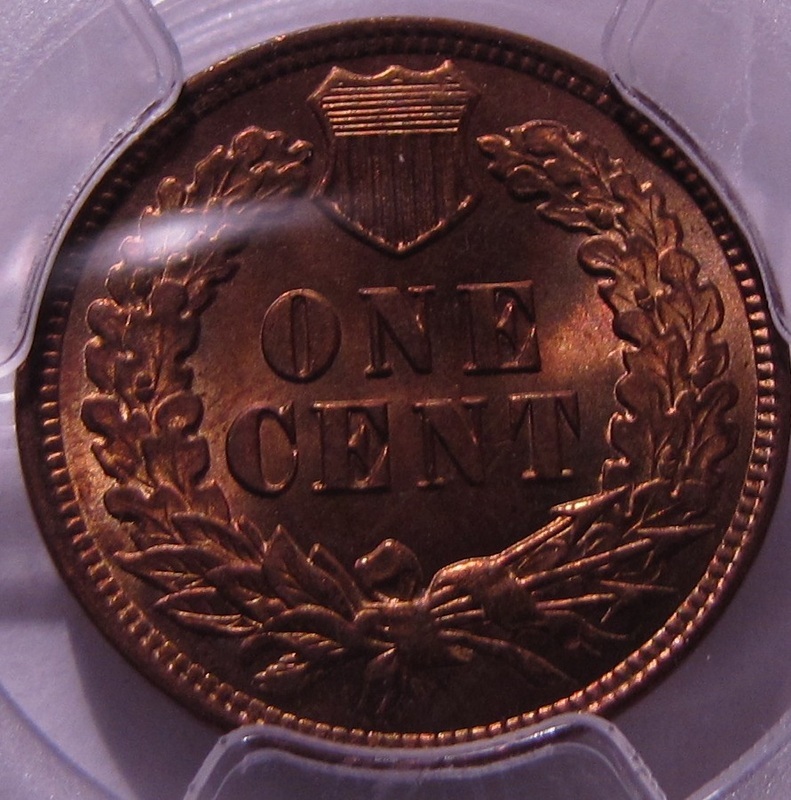 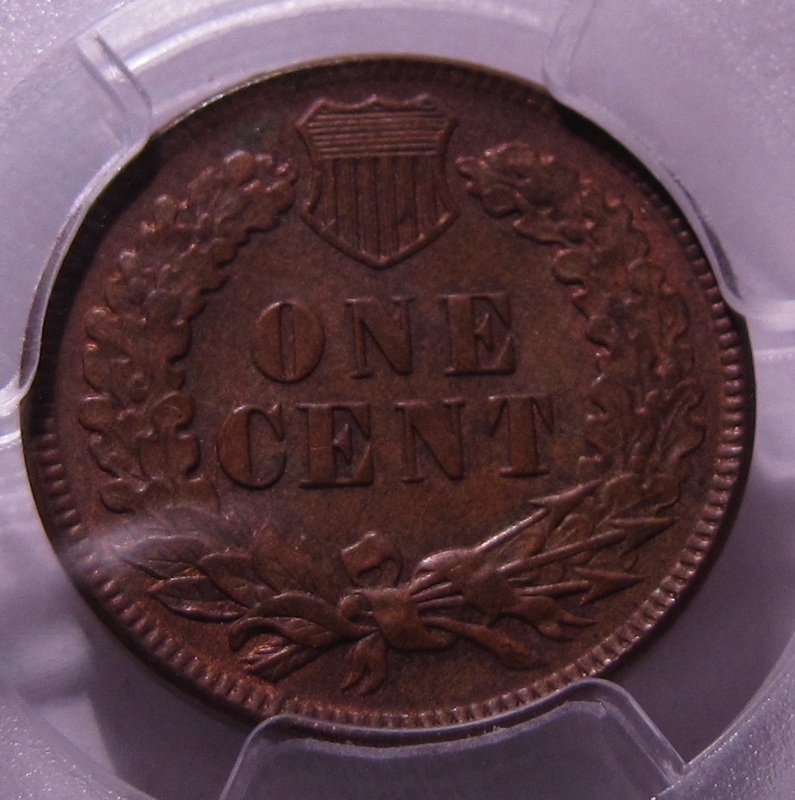 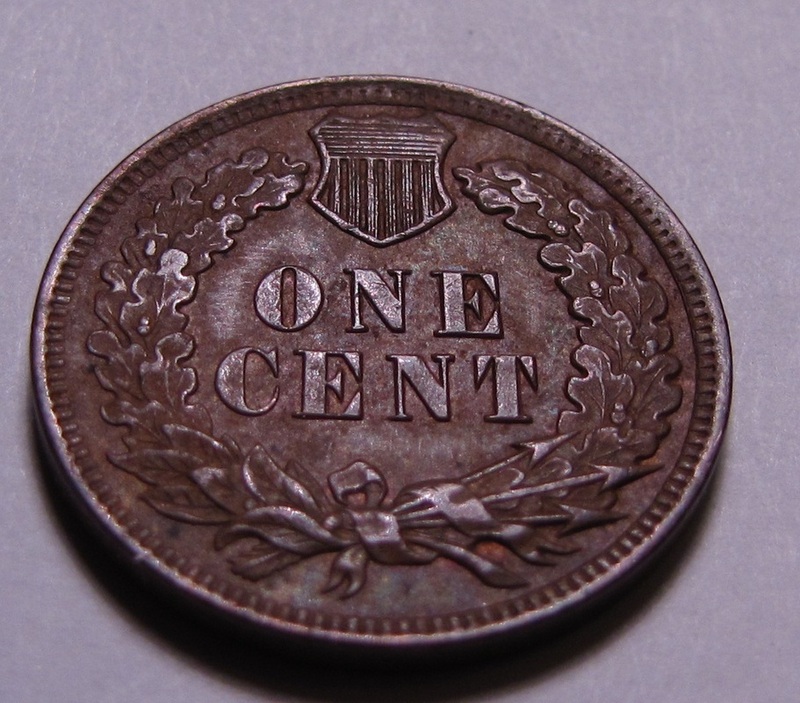 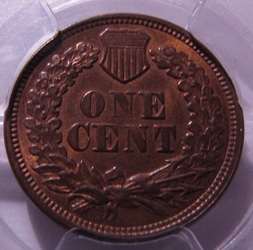 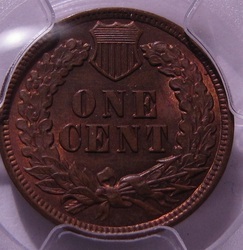 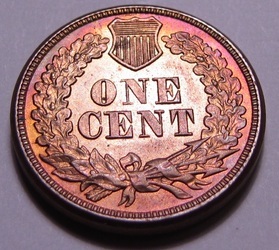 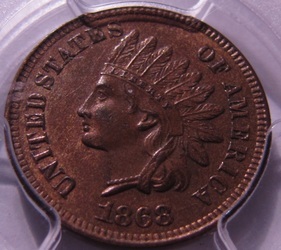 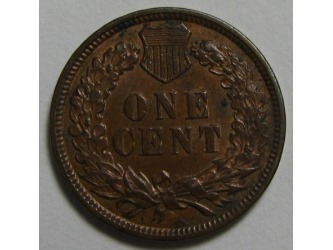 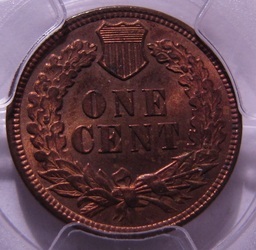 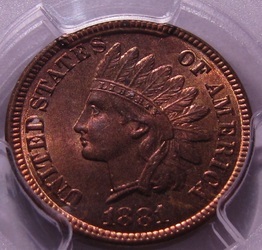 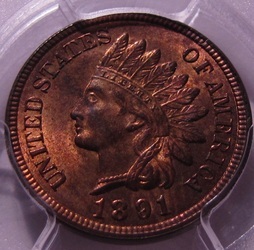 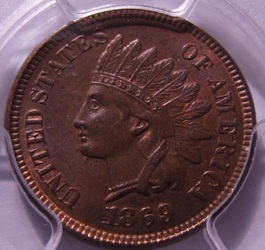 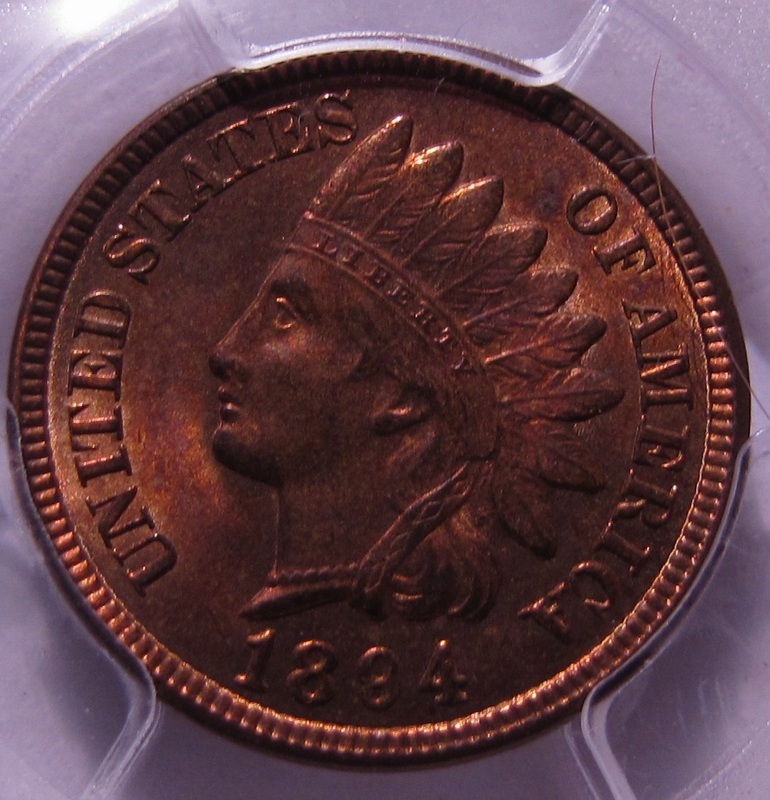 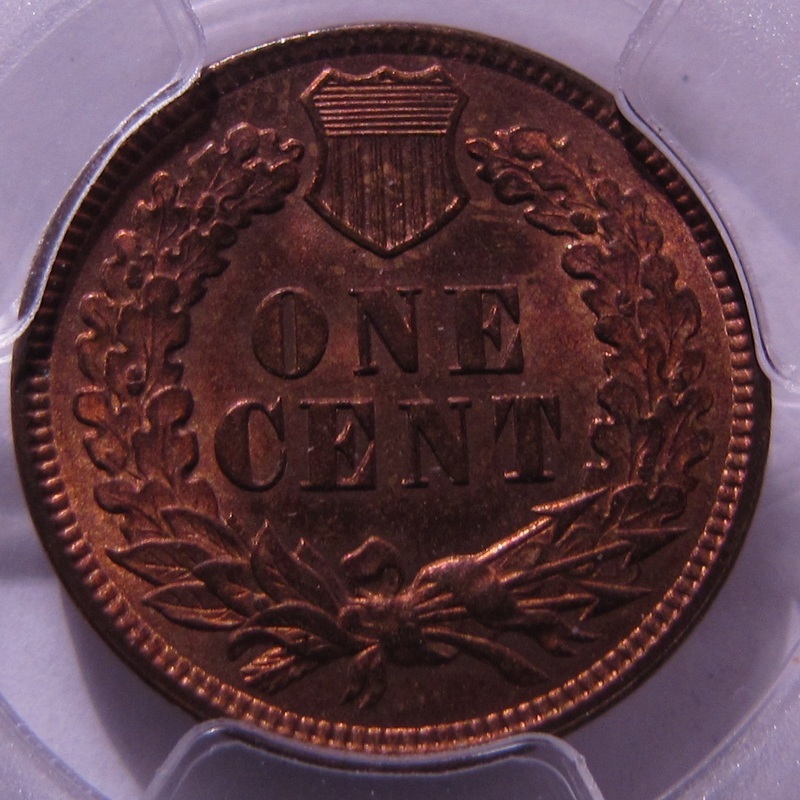 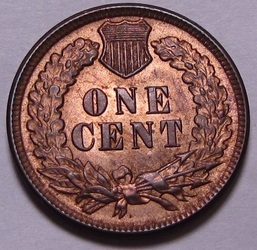 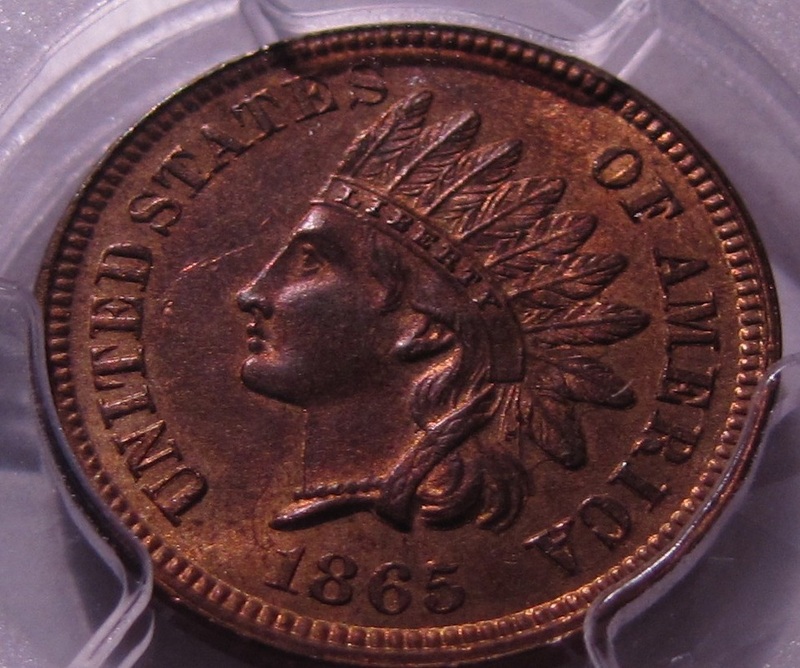 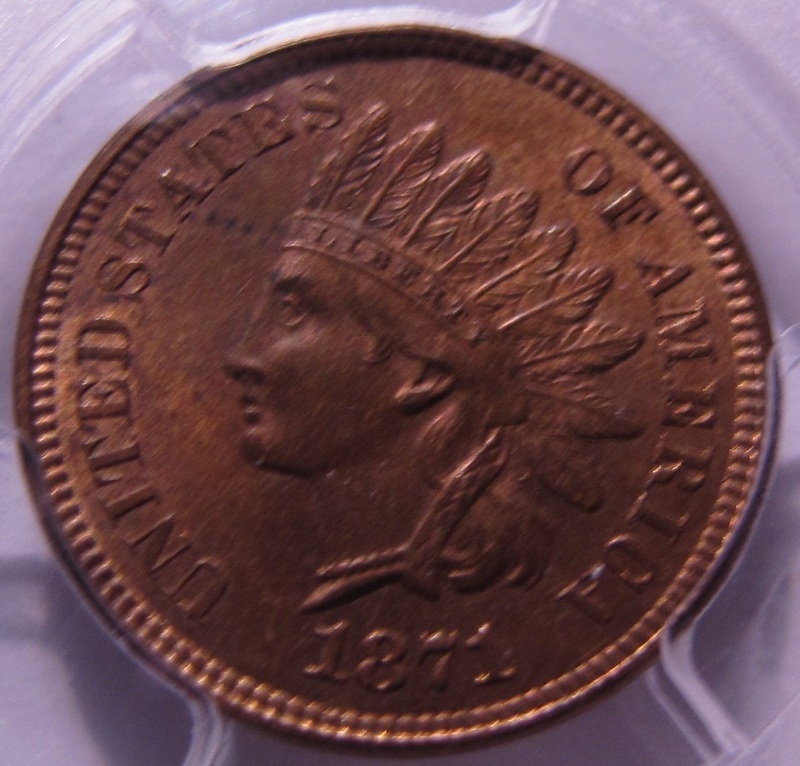 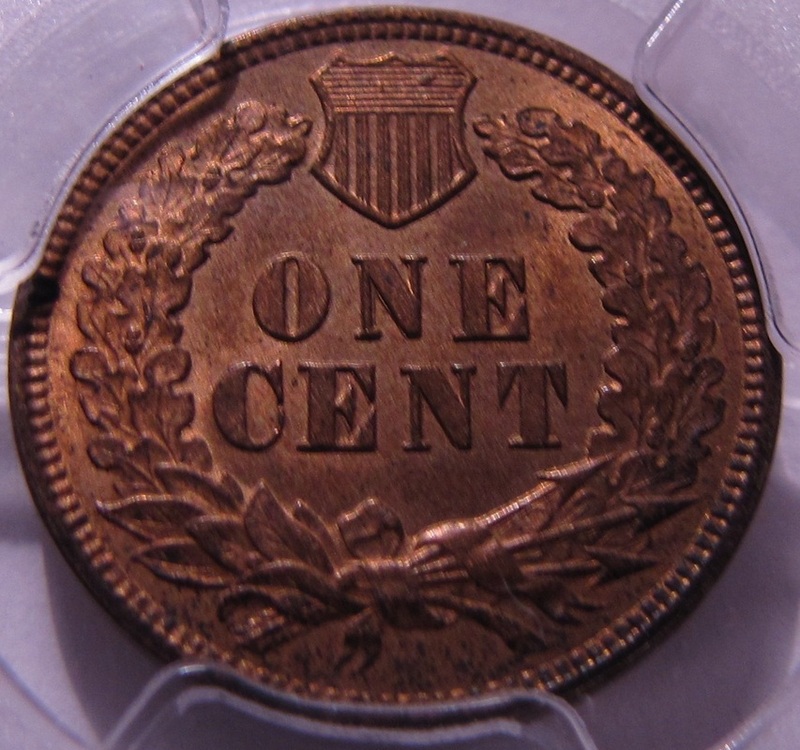 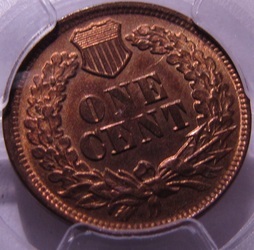 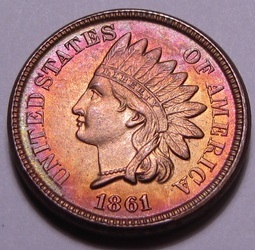 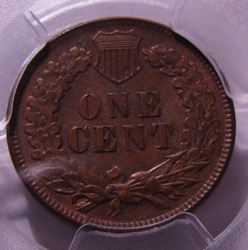 But my favorite of the bunch is the 1861, which has the most beautiful peripheral toning I've ever seen on one of these! 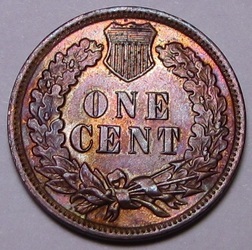 What a gorgeous example! 1864 was a busy year for the penny. 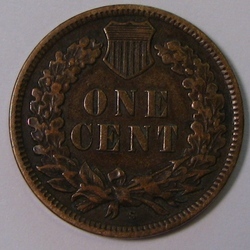 The copper nickel composition was changed partway through the year to bronze, which allowed for better strike characteristics. 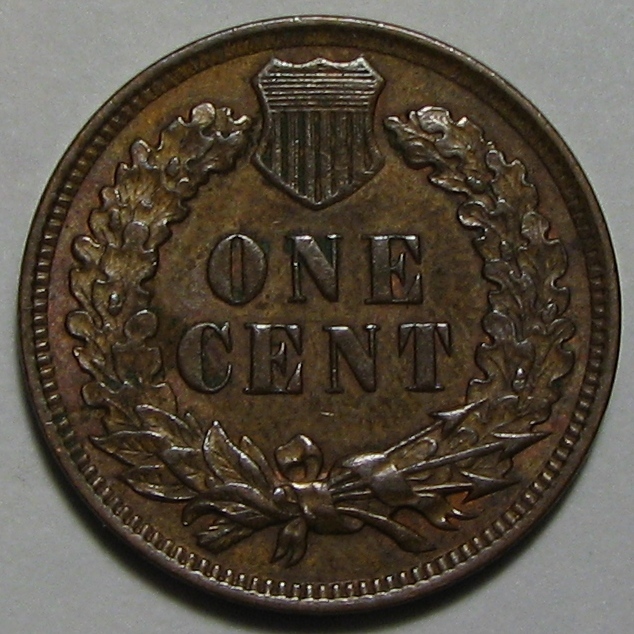 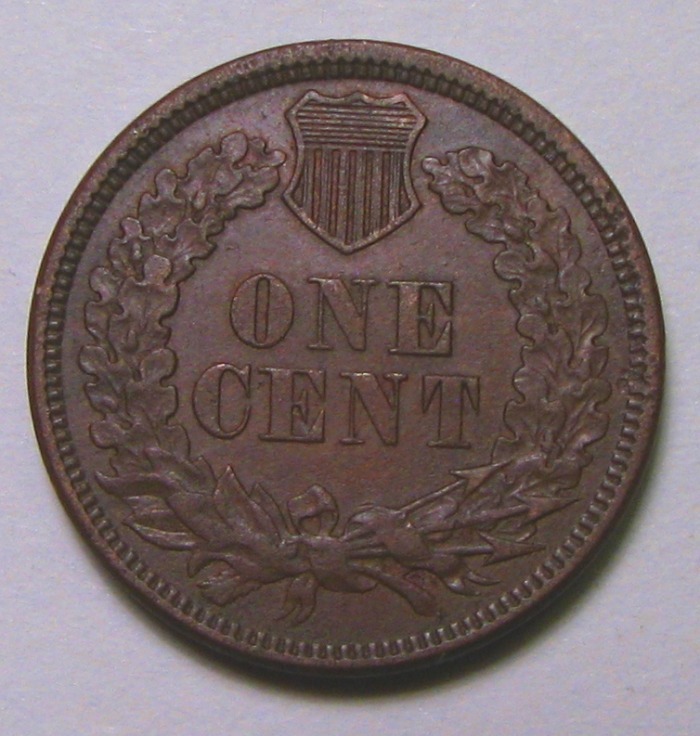 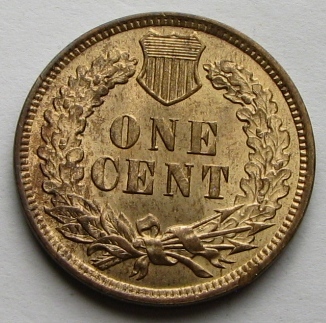 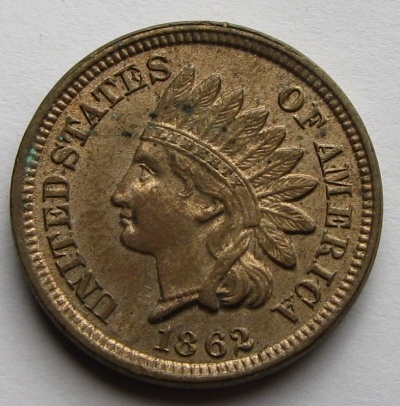 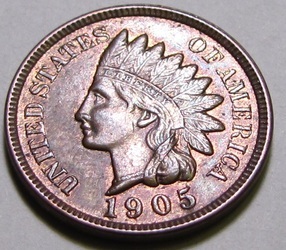 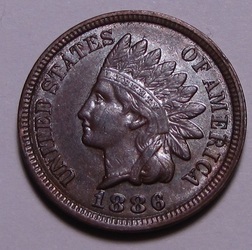 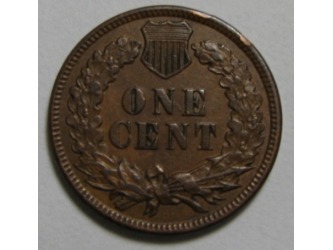 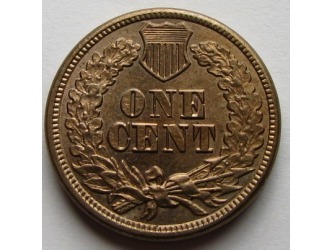 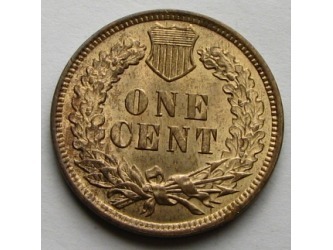 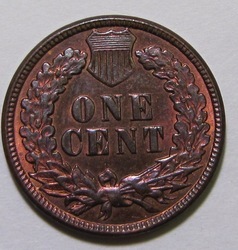 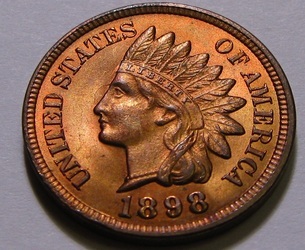 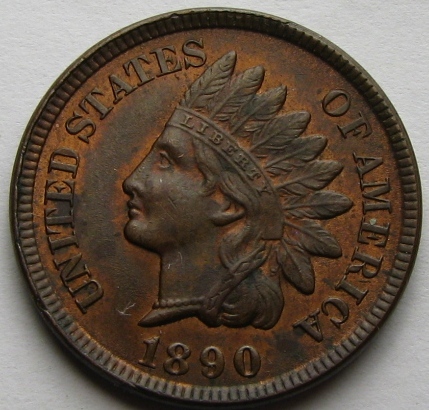 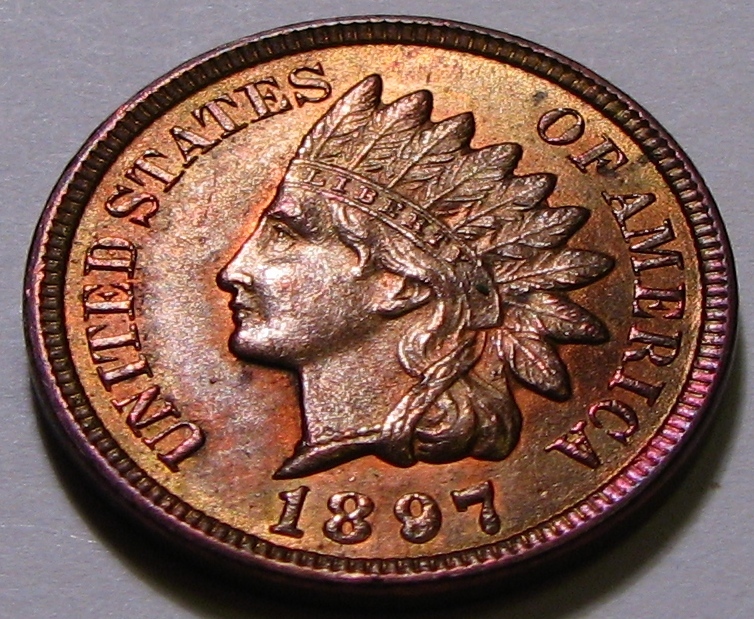 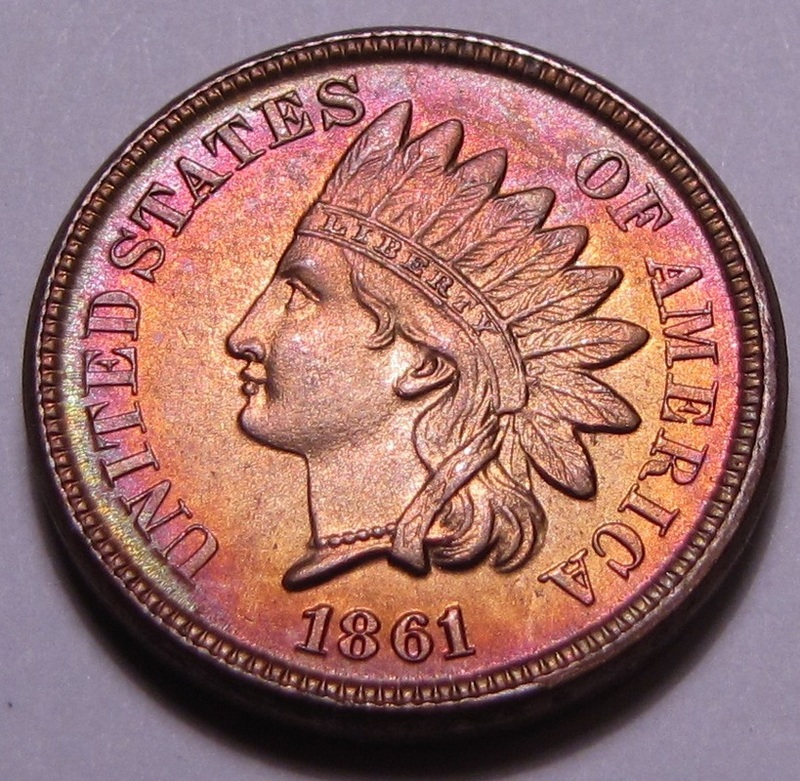 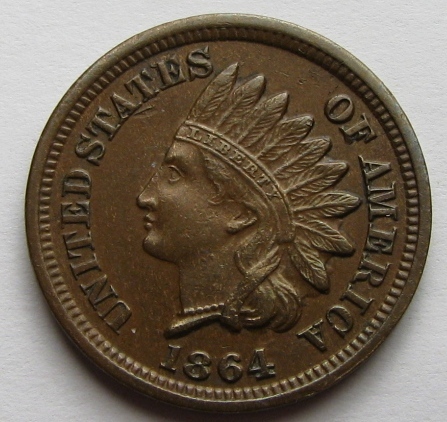 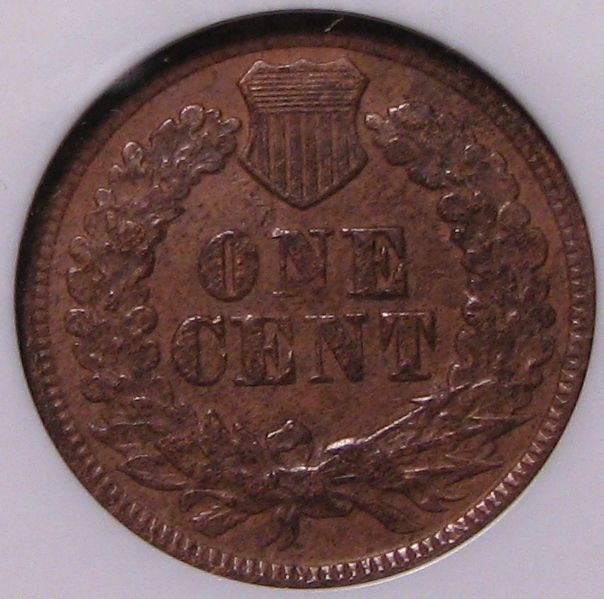 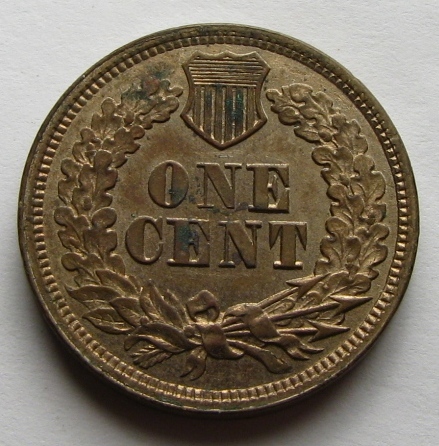 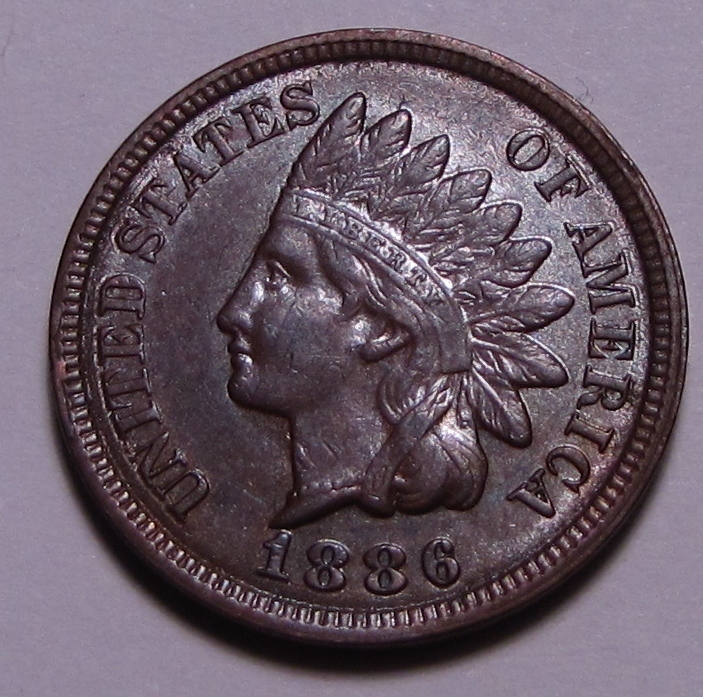 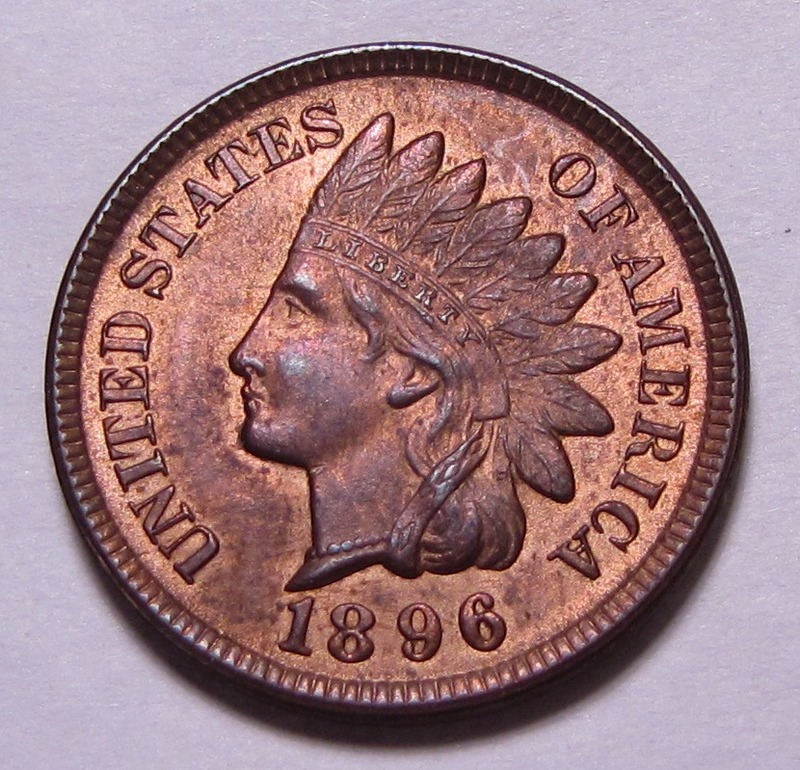 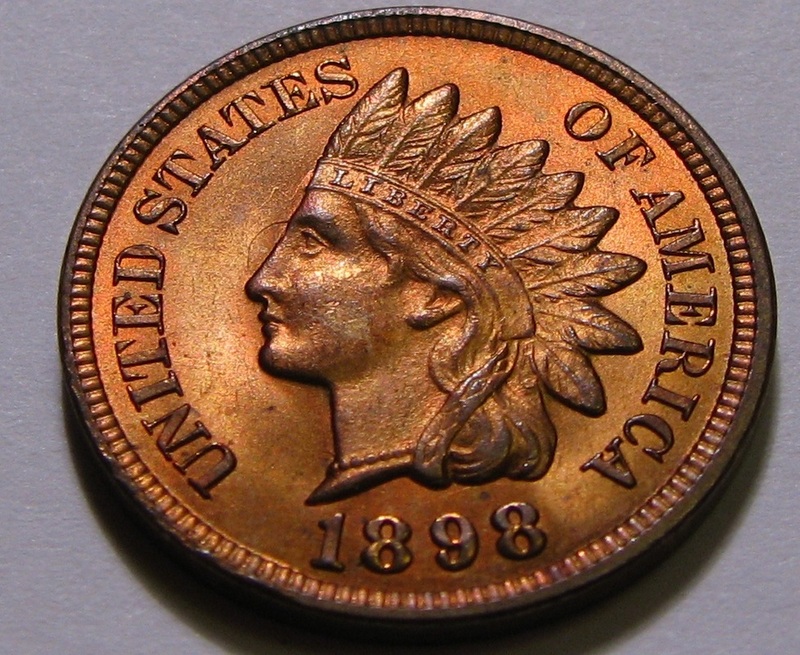 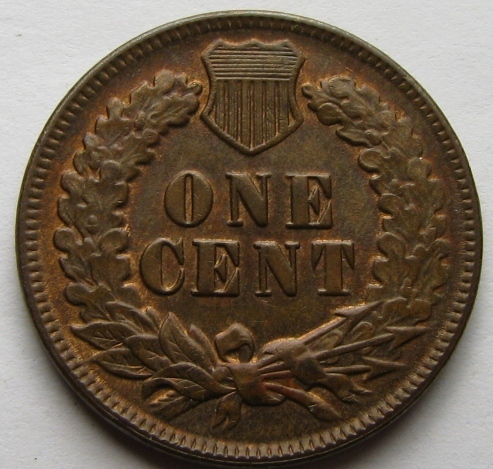 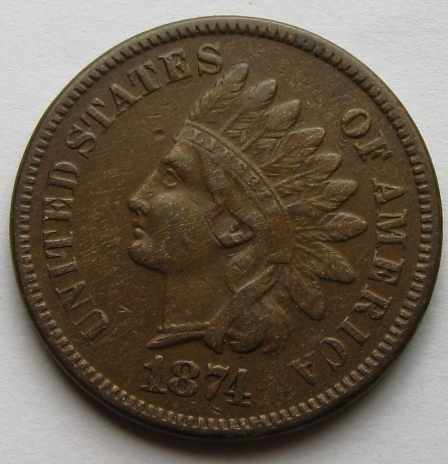 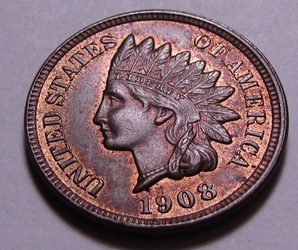 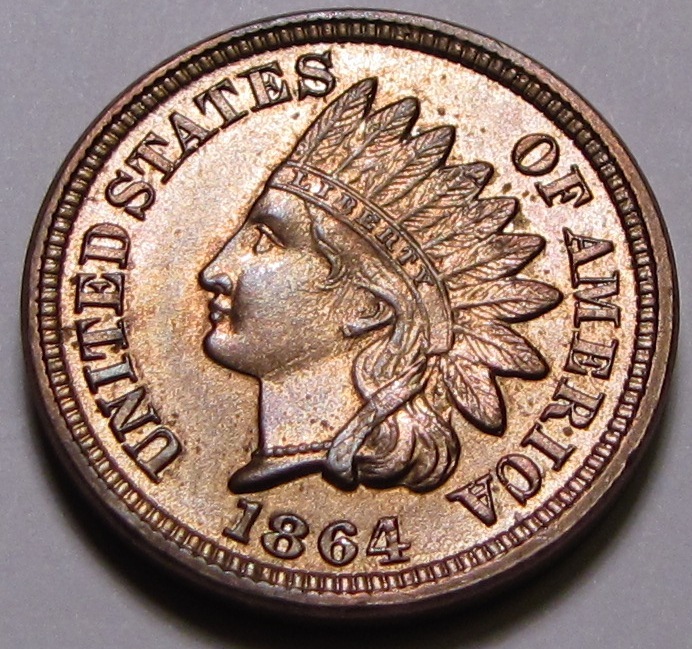 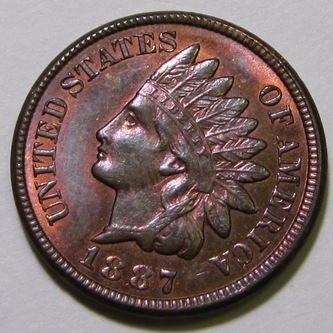 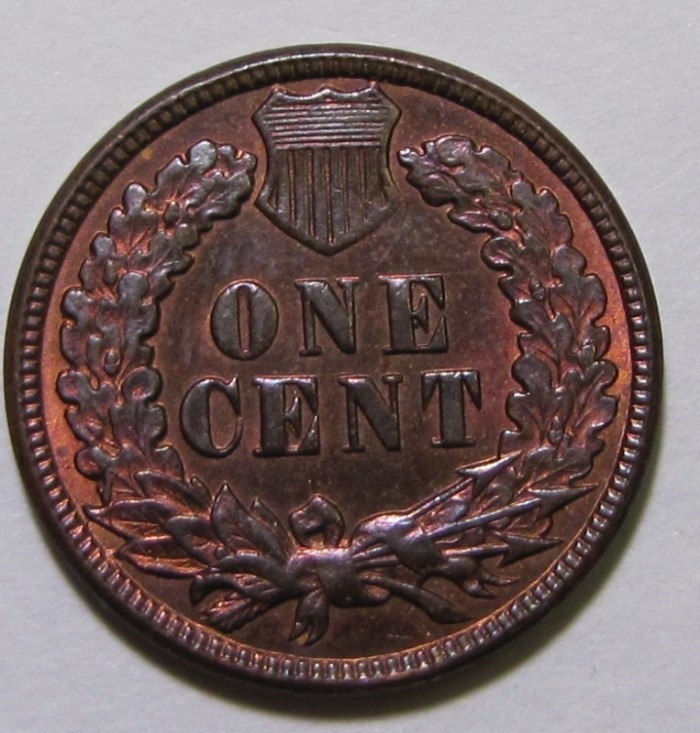 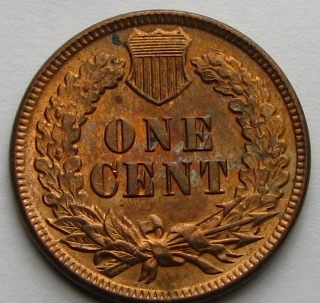 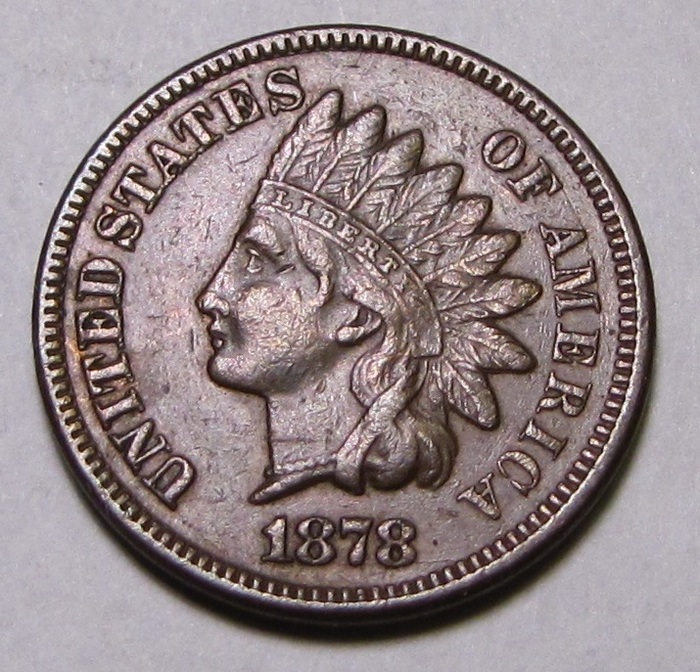 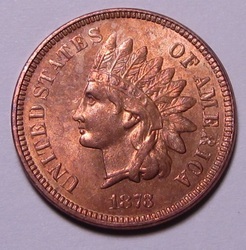 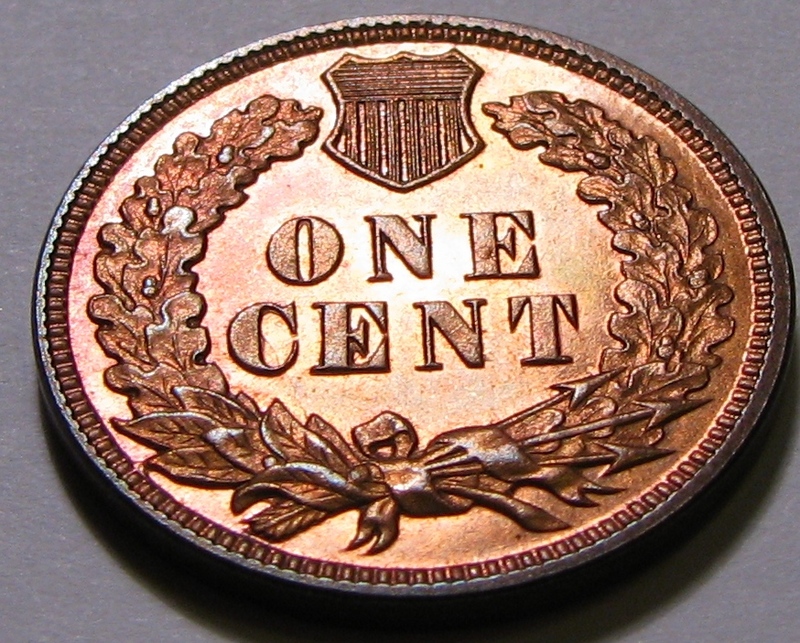 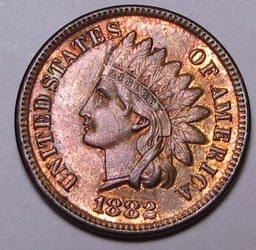 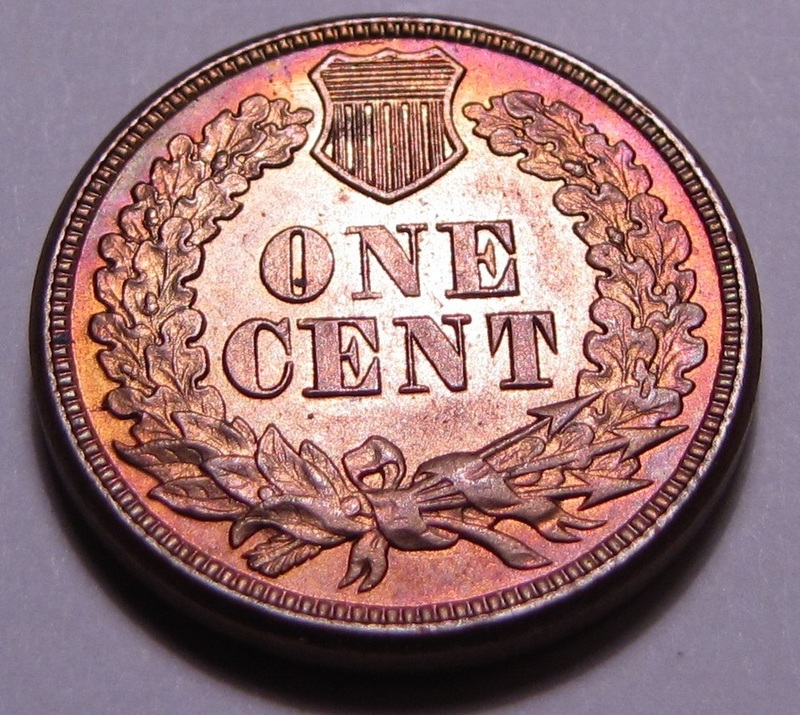 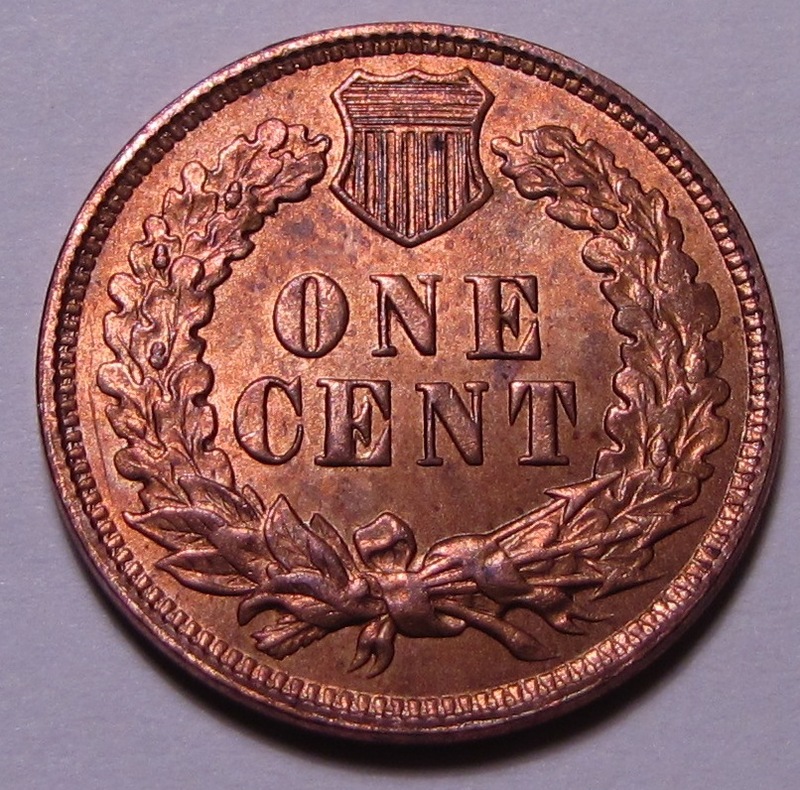 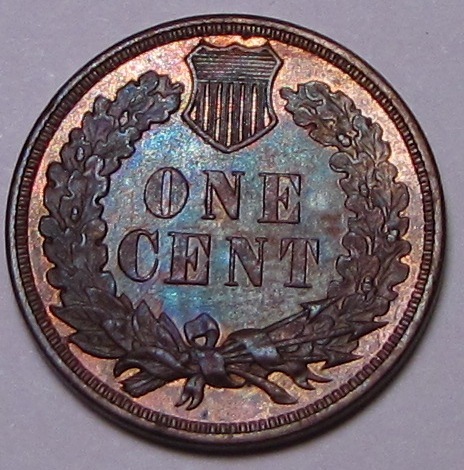 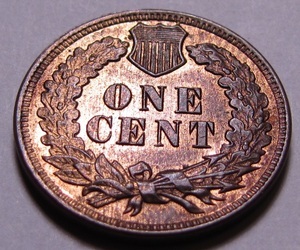 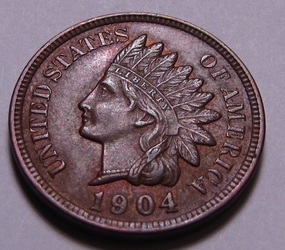 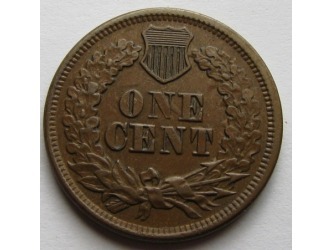 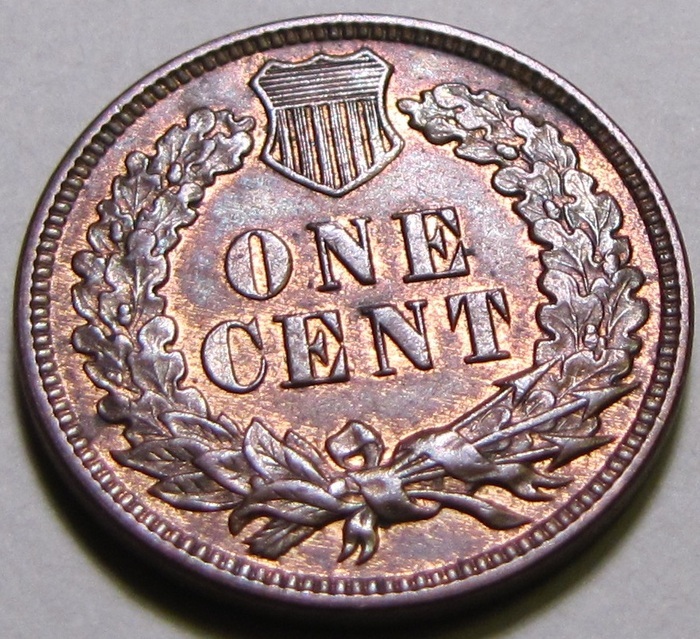 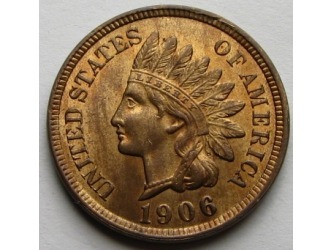 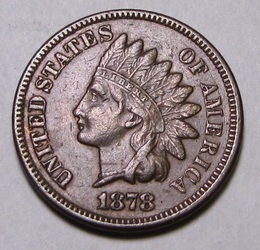 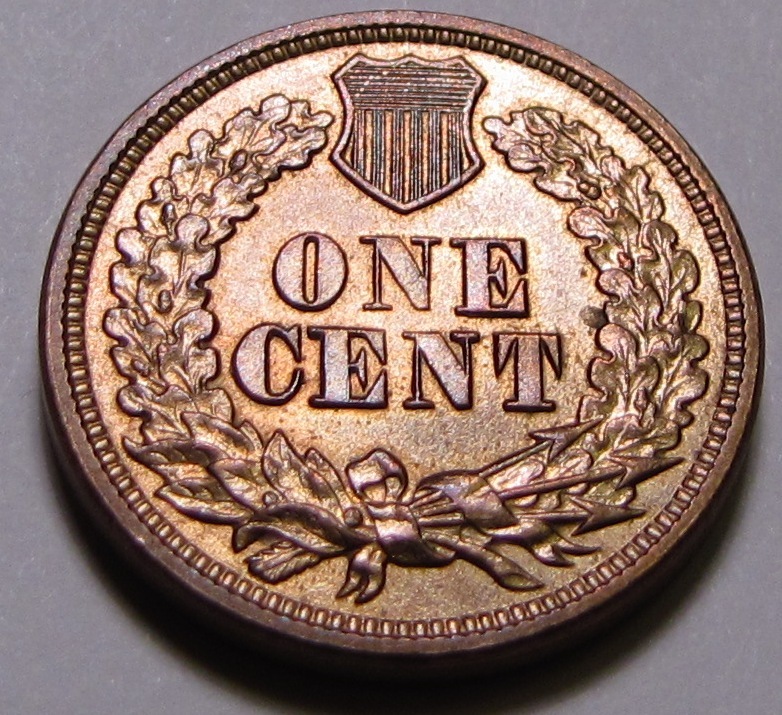 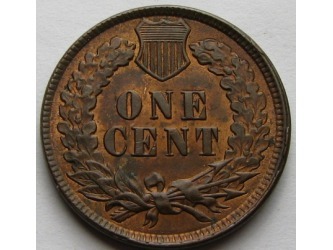 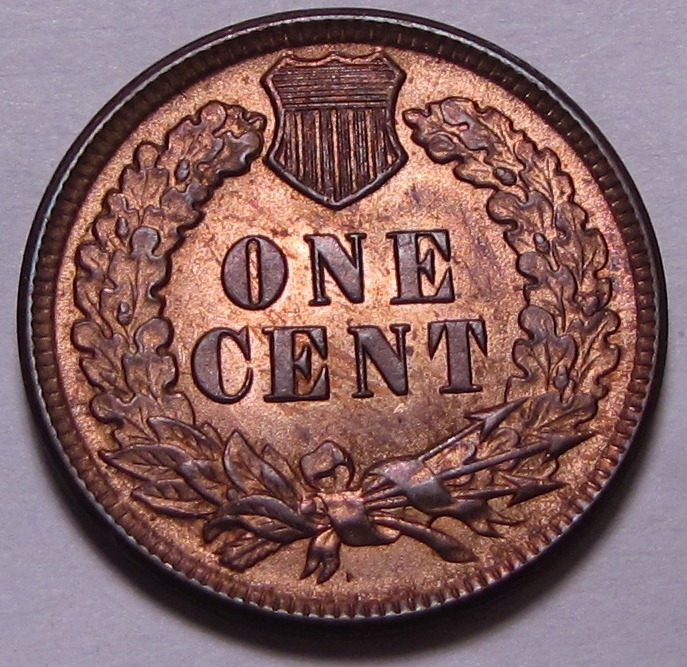 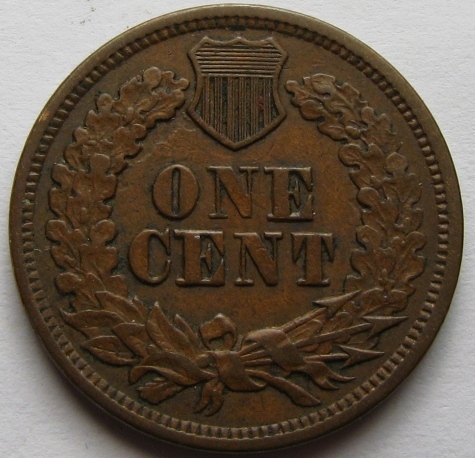 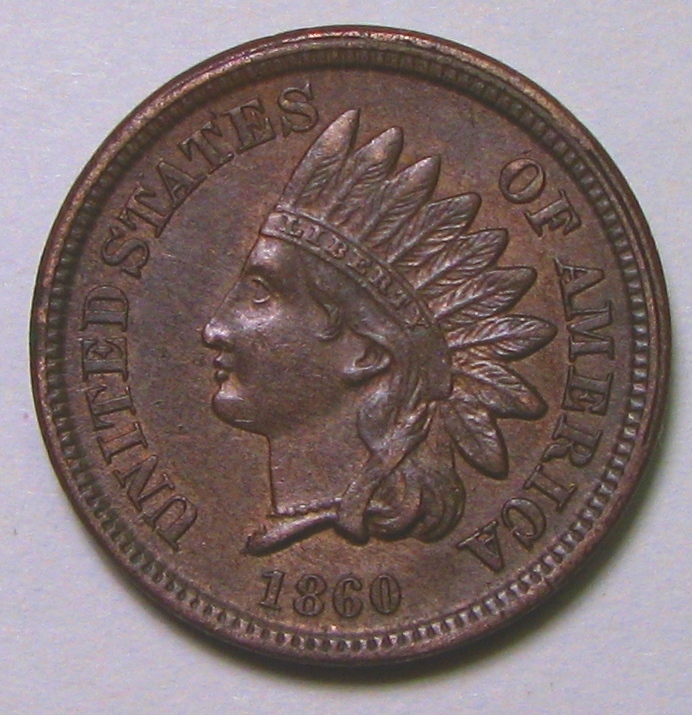 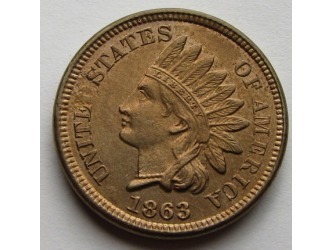 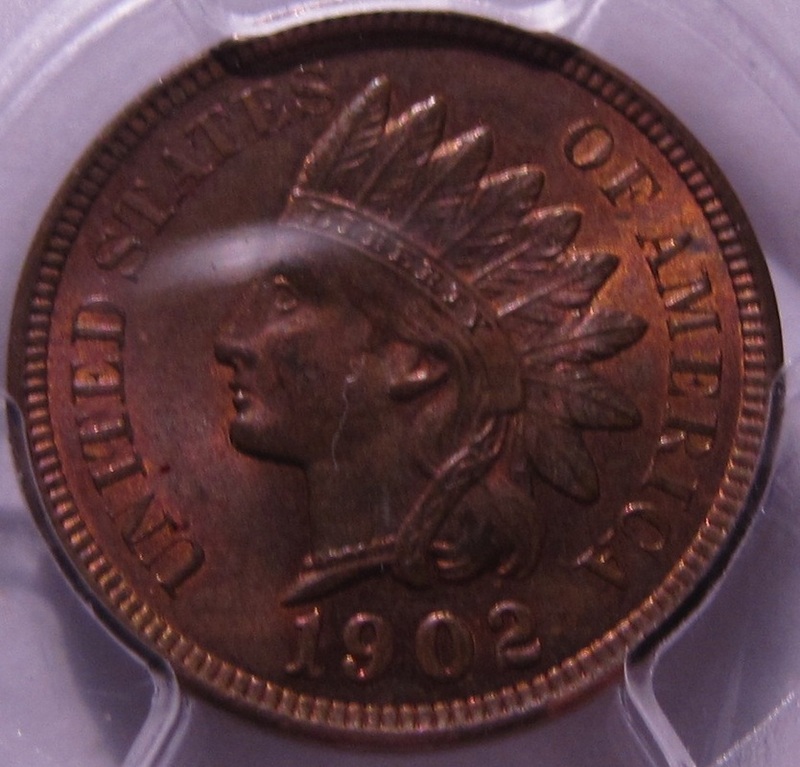 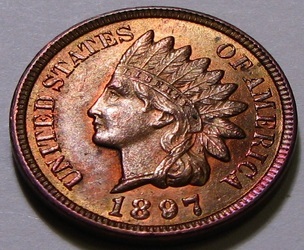 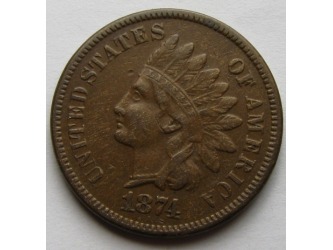 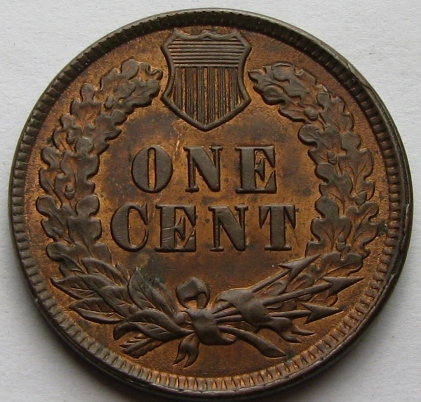 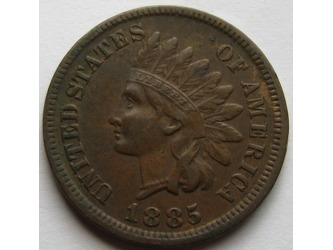 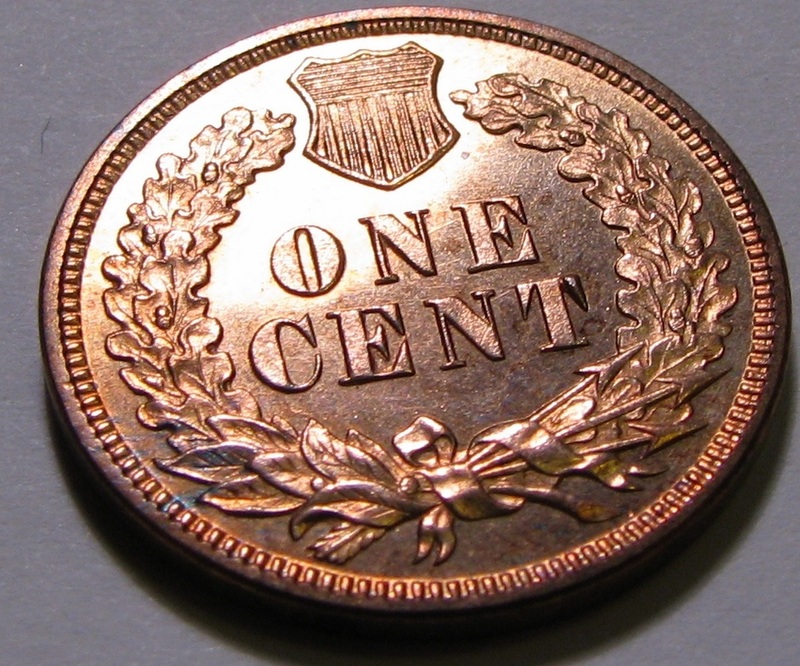 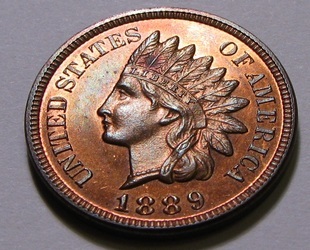 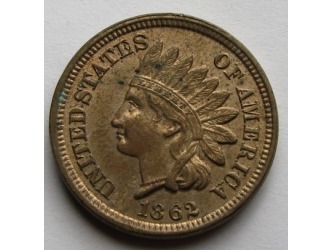 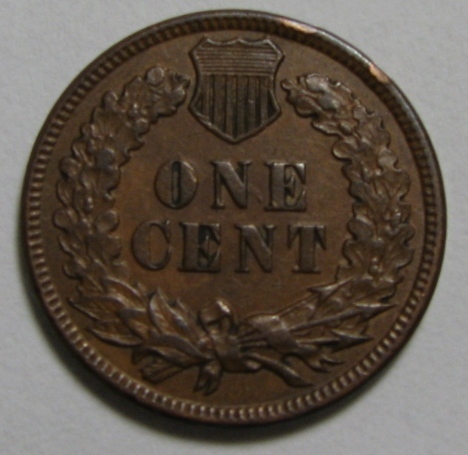 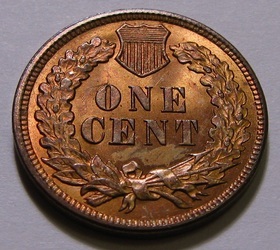 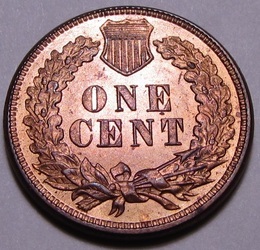 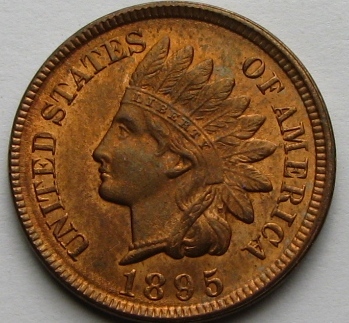 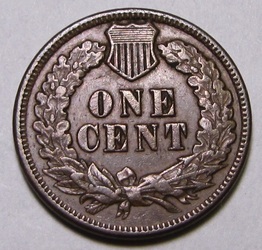 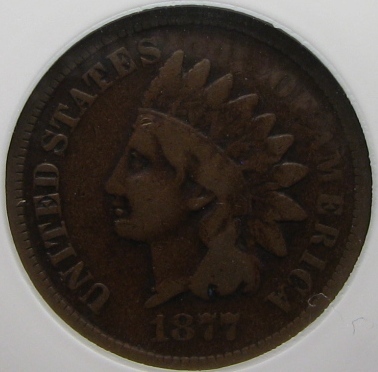 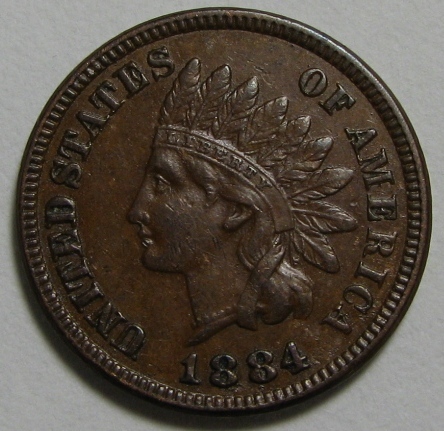 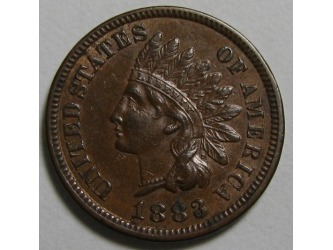 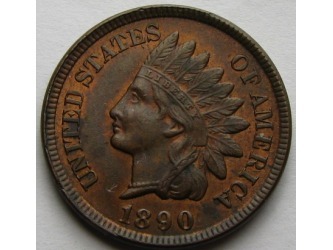 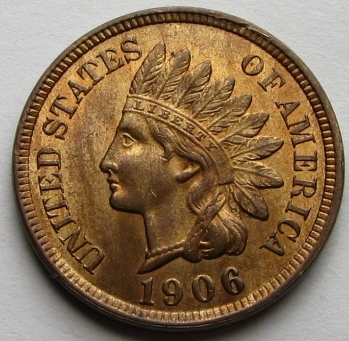 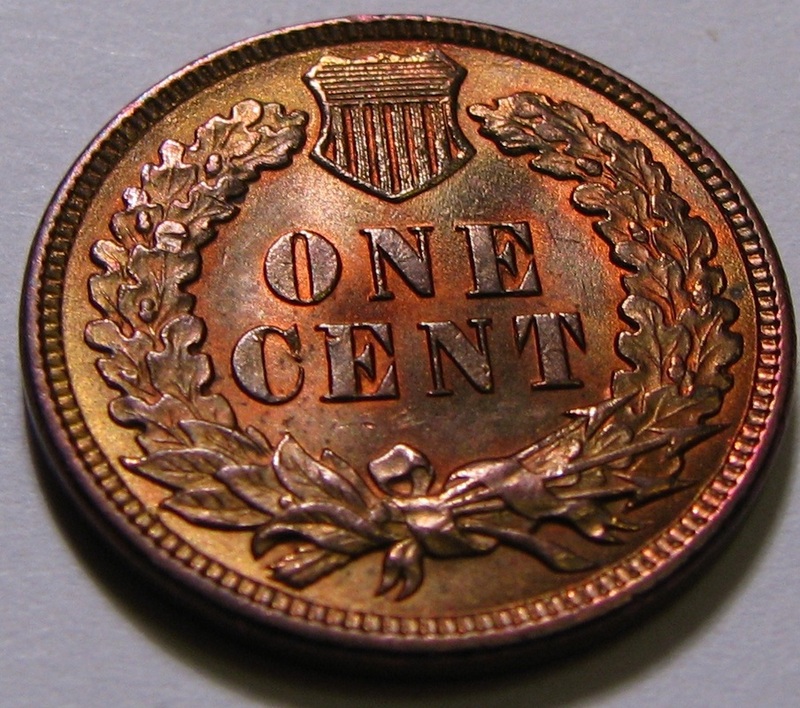 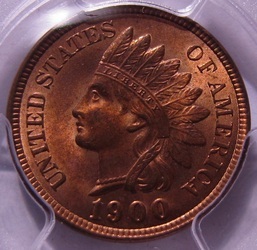 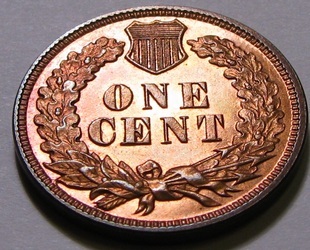 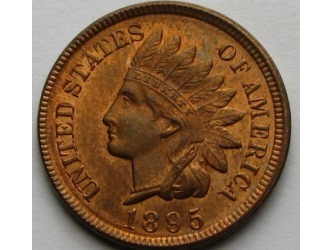 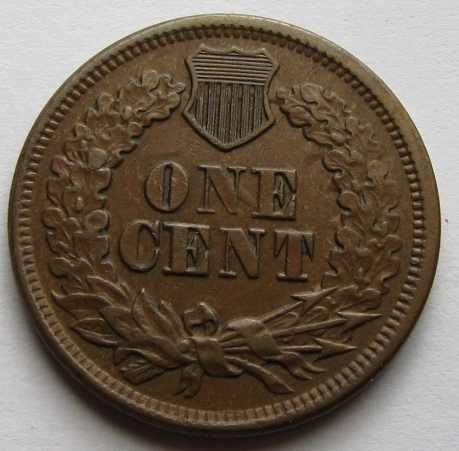 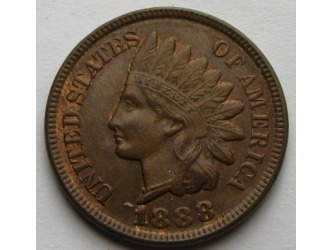 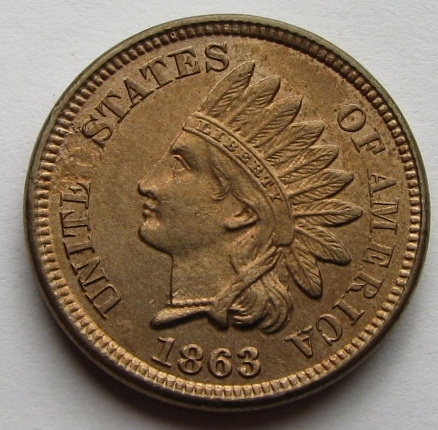 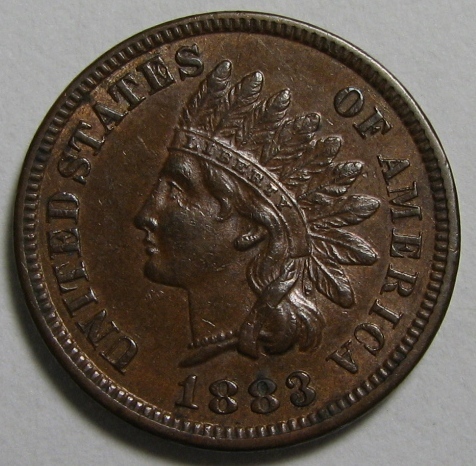 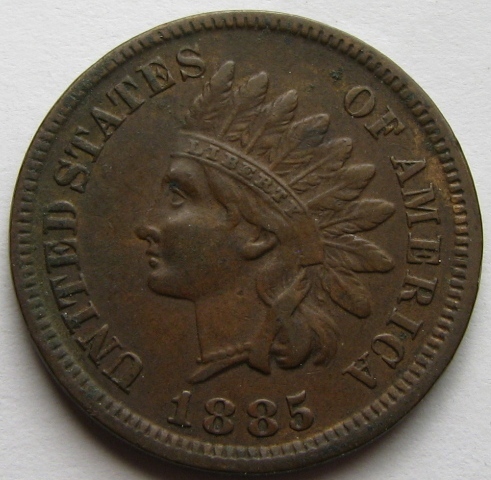 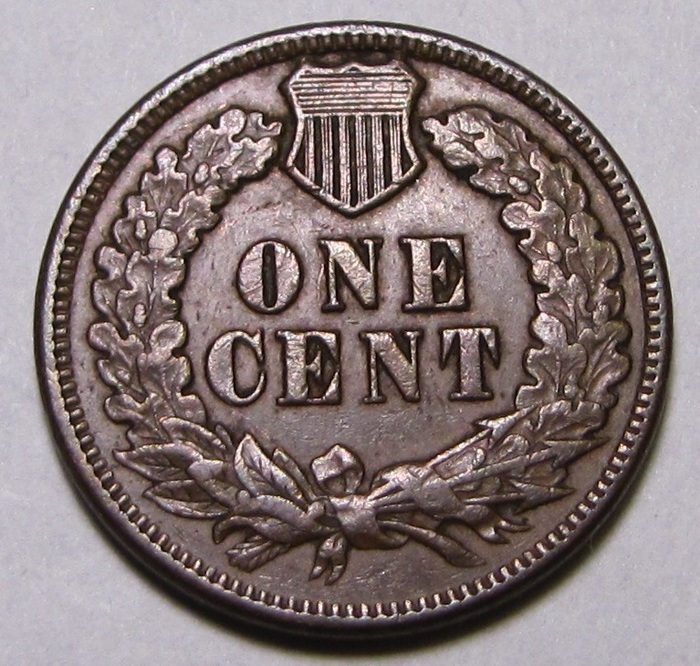 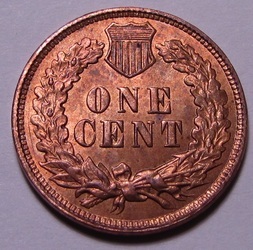 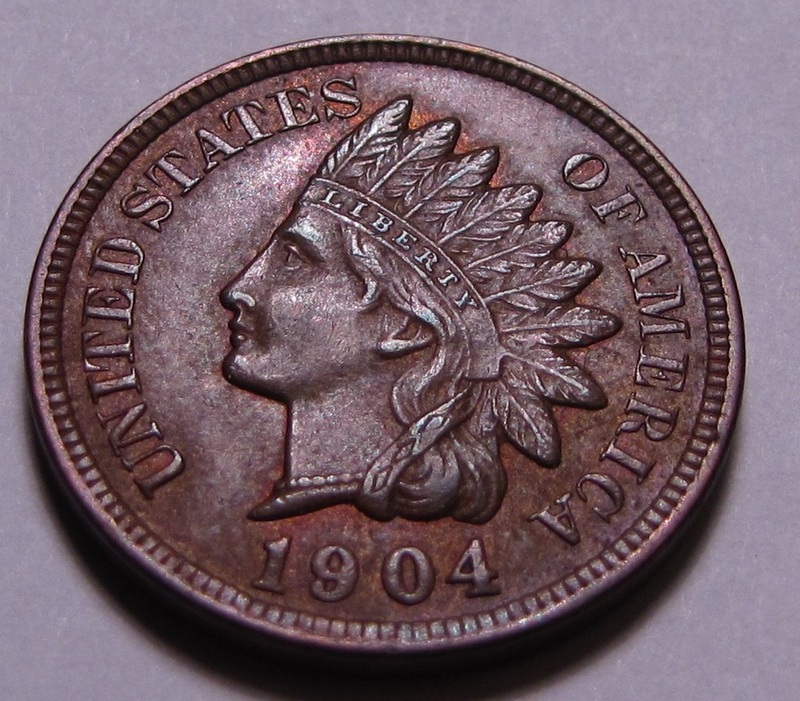 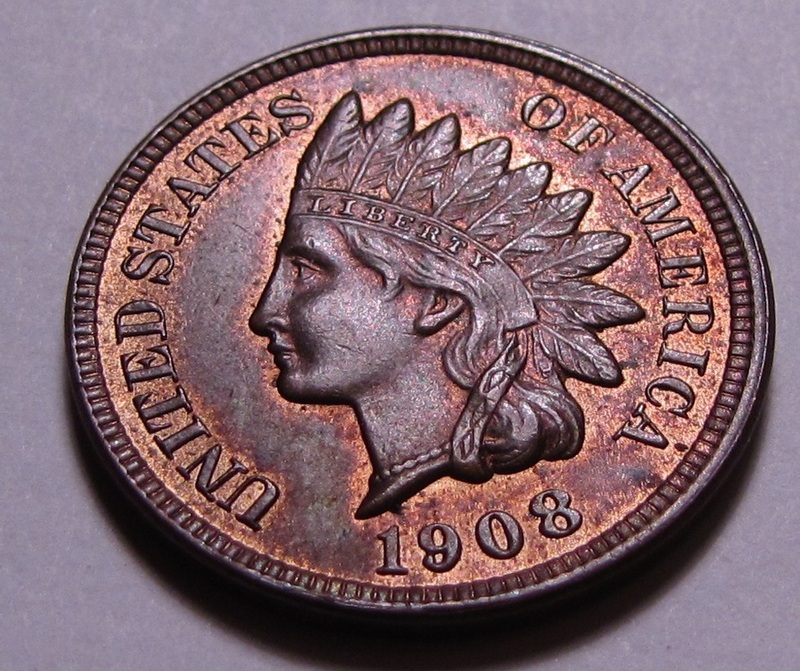 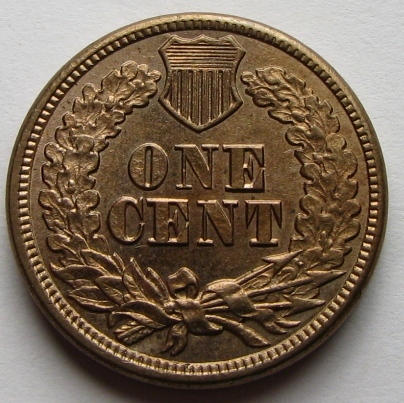 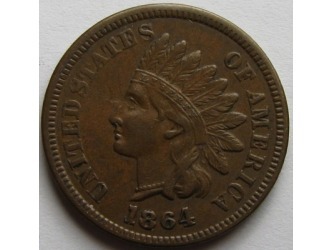 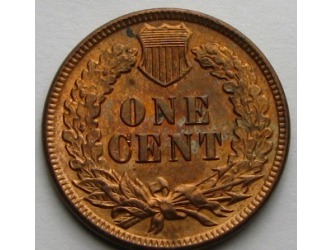 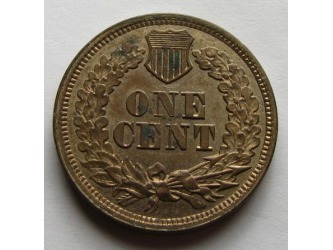 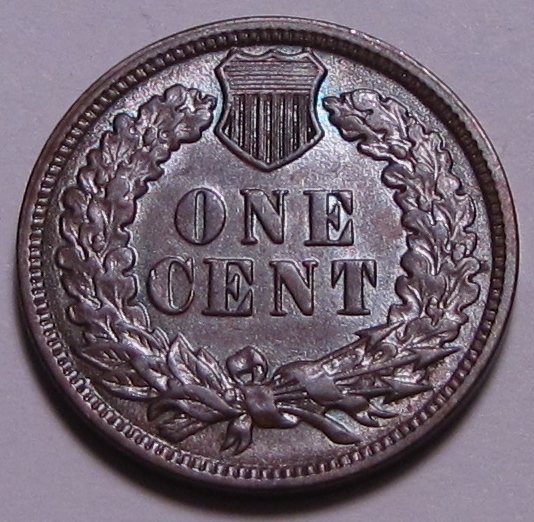 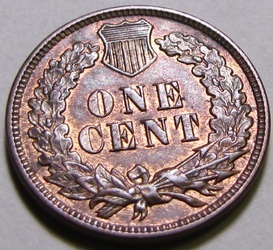 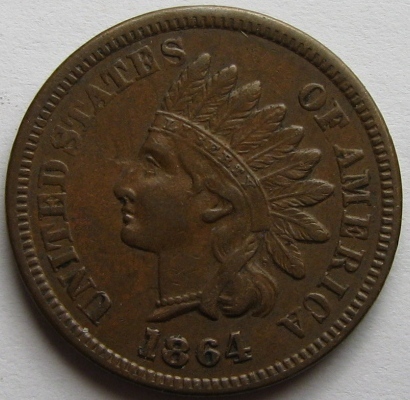 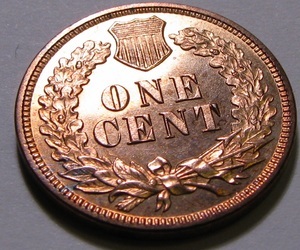 And the penny's designer, James Longacre, finally had his initial "L" added to the design, located between the last feather and the ribbon on the indian's head. The 1864-L is considered a rarity, especially in better grades. 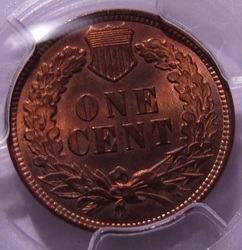 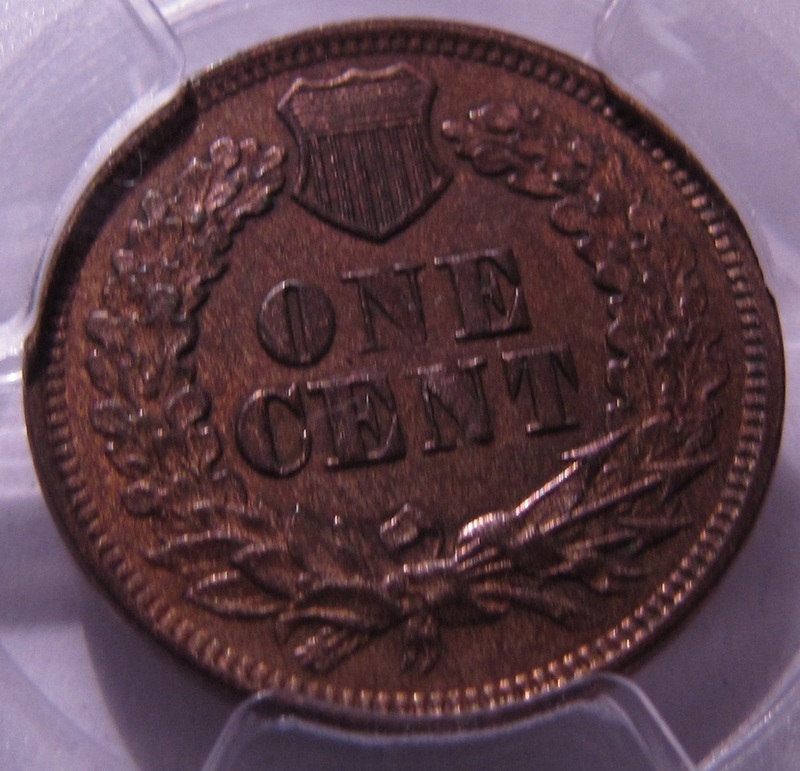 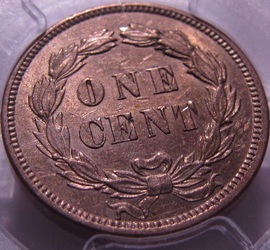 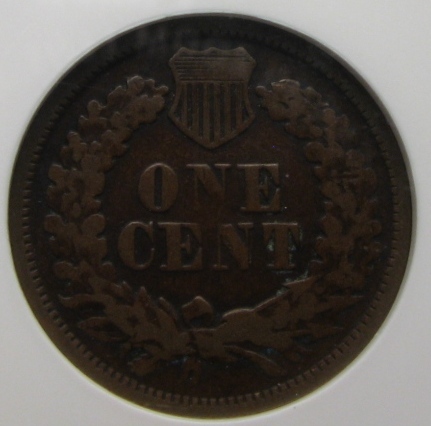 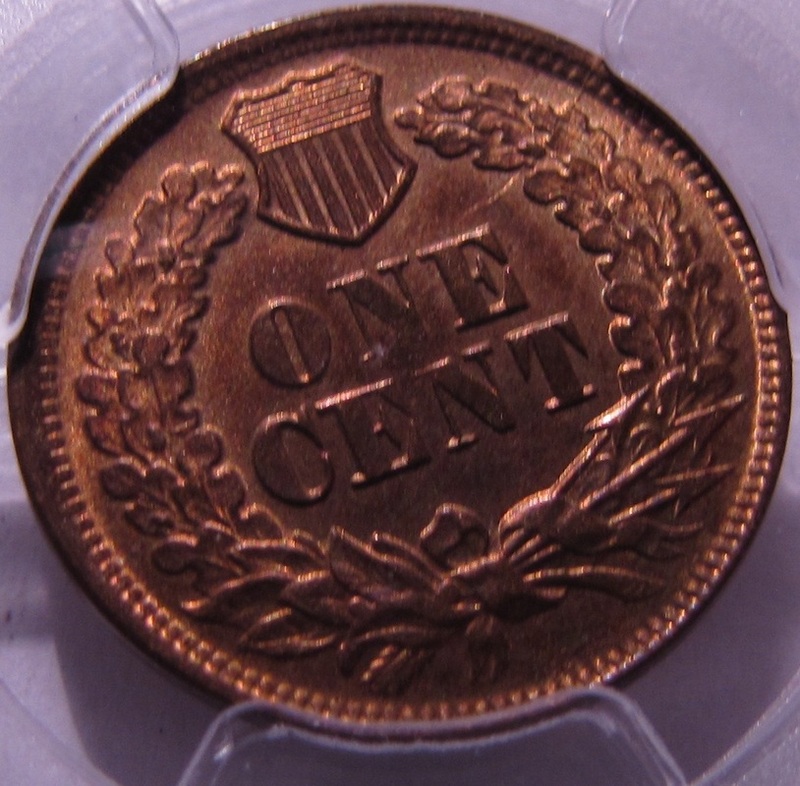 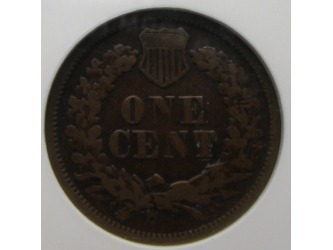 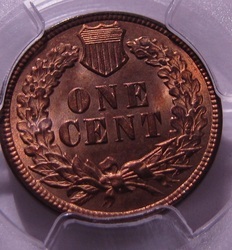 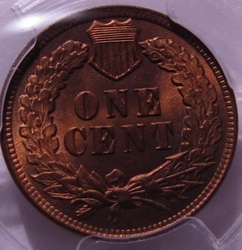 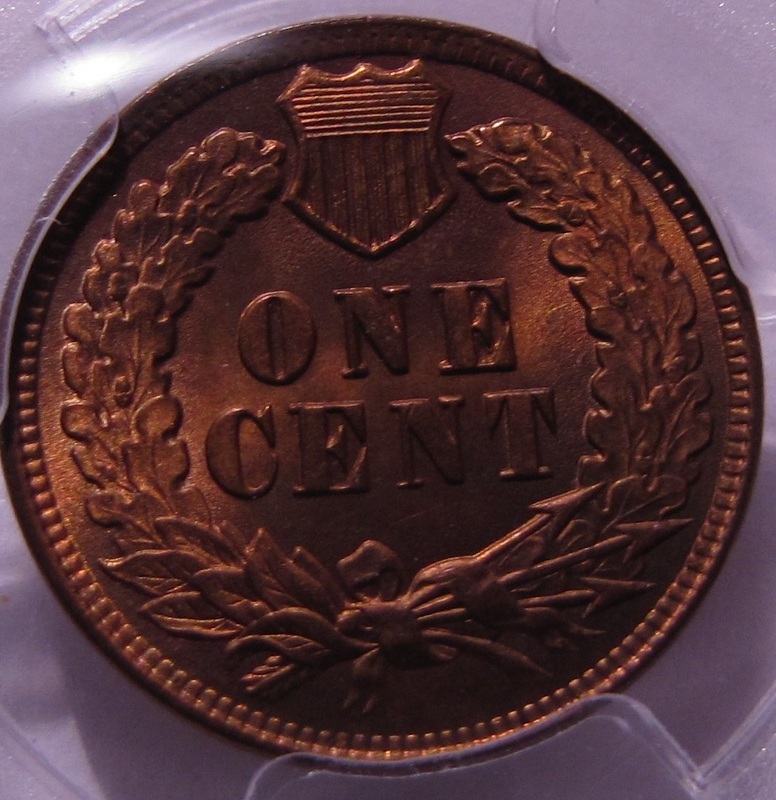 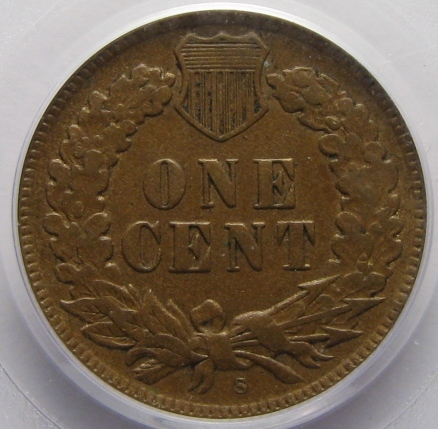 So there are actually three 1864 dated cents: The copper nickel, in the previous gallery, the bronze no "L" 1864, and the bronze with "L" version, both in this gallery. 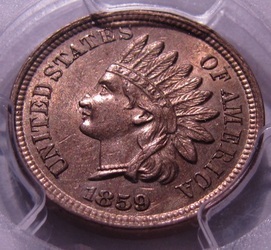 1864-L PCGS XF45; 1865 PCGS MS63RB; 1866 PCGS MS63RB; 1867 PCGS MS64RB; 1868 PCGS AU58BN; 1869/69 PCGS MS63RB; 1870 PCGS XF40; 1871 PCGS MS64RB; 1872 PCGS PROOF QUESTIONABLE COLOR, UNC DETAILS; 1873 QUESTIONABLE COLOR, UNC DETAILS; 1875 PCGS MS64RB; 1876 PCGS MS63BN; 1877 PCGS VG8; 1878 PCGS XF45 AND 1879 PCGS MS64BN. This last run of Indians represents many of the easier-to-acquire later dates. 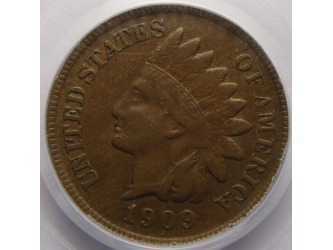 The exceptions to this are the 1908-S and 1909-S. The 1908-S was the first penny minted at the San Francisco Mint, so it's pretty cool to own one. 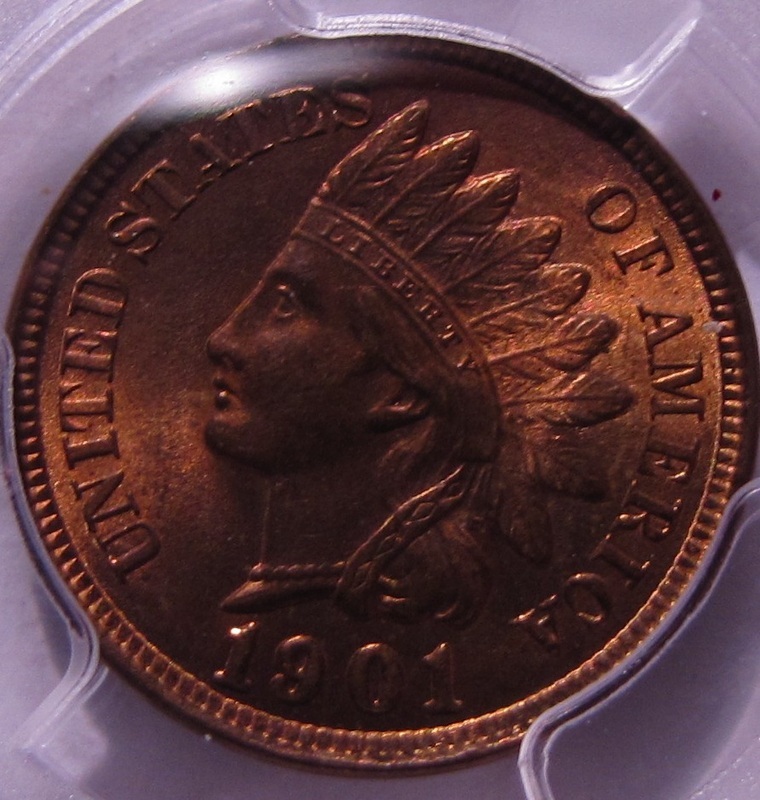 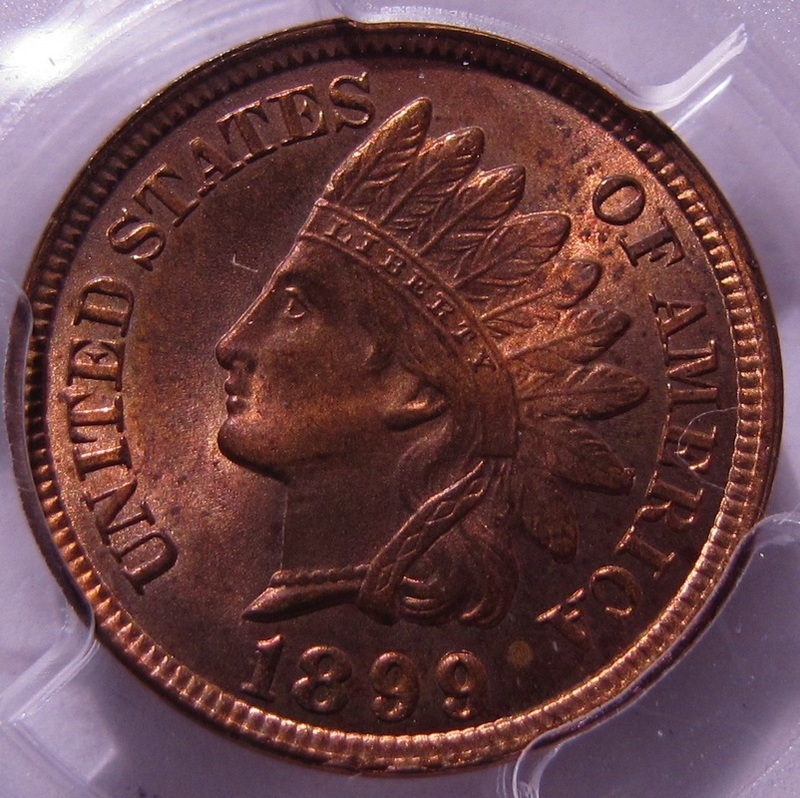 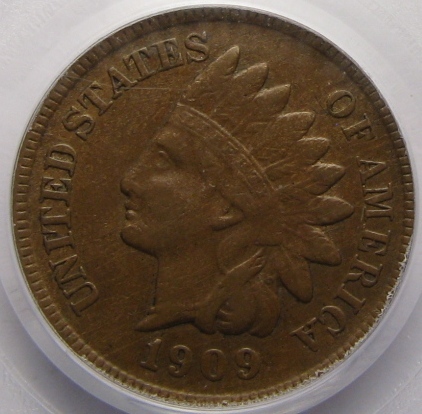 And the 1909-S is the lowest mintage Indian, and considered a key date. The coin pictured here was bought on ebay, from a rather crummy photo and description. 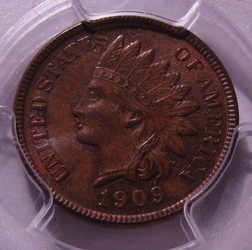 It turned out to look MUCH better in person, so I was quite pleased with my purchase! 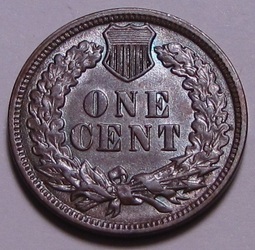 Also, look at the 1880-in addition to its incredible toning, the bottom of the second 8 in the date is cut off. 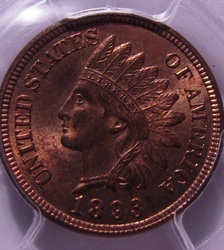 12/27/11-Upgraded three pennies in this group today: An 1889 PROOF, an uncirculated 1897 and an uncirculated 1898. 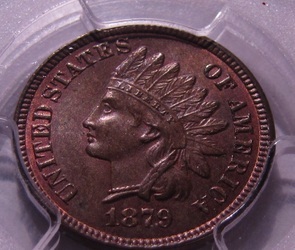 Very happy with these acquisitions! 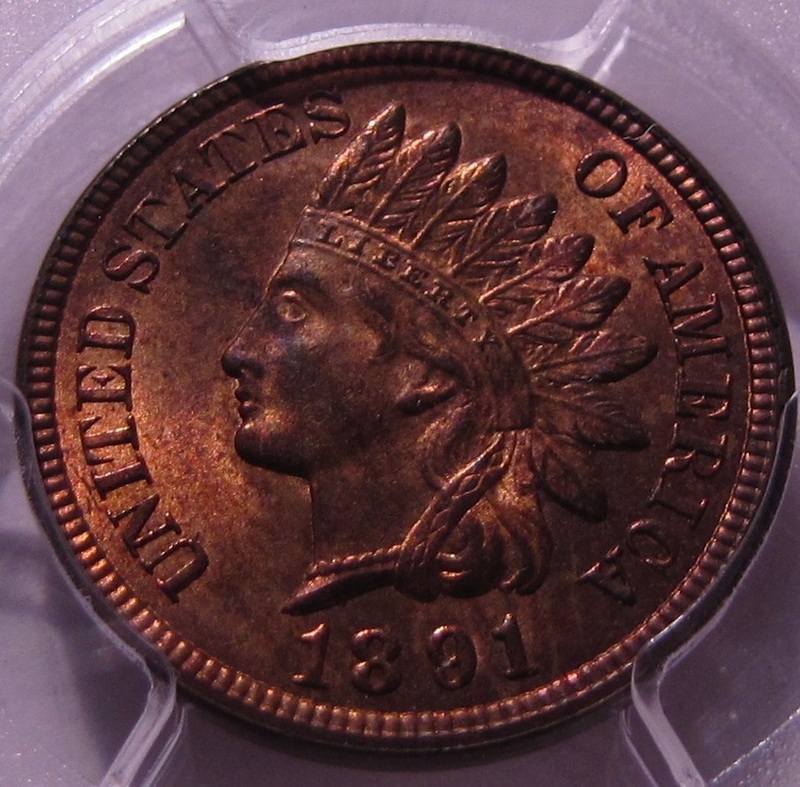 1881 PCGS MS64RB; 1889 PCGS PR64RB; 1891 PCGS MS63RB; 1893 MS64RB; 1894 MS64RB; 1899 PCGS MS64RB; 1900 PCGS MS64RB; 1901 PCGS MS64RB; 1902 PCGS MS63RB; 1903 PCGS MS64RB; 1908-S PCGS XF40; 1909 PCGS MS63BN; 1909-S PCGS XF40.